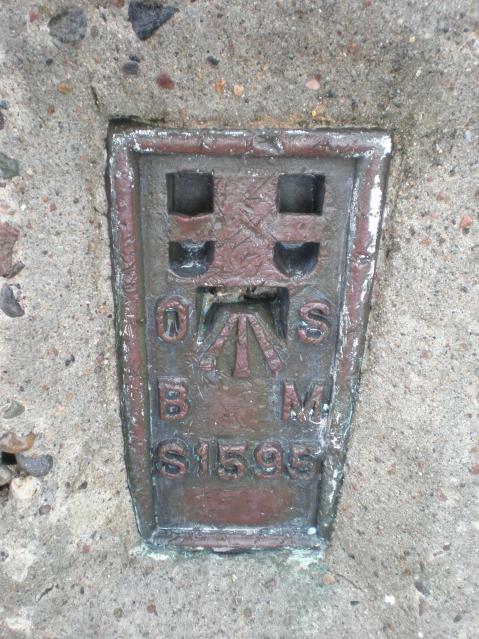 There are 176 photos for this trigpoint (view album). Is ranked joint 214th with 1 other trig (more). See 167 more in the album. Too cloudy to see the views! Misty and the wind chill was freezing. Glad to have finally bagged this one and knock it off my bucket list. 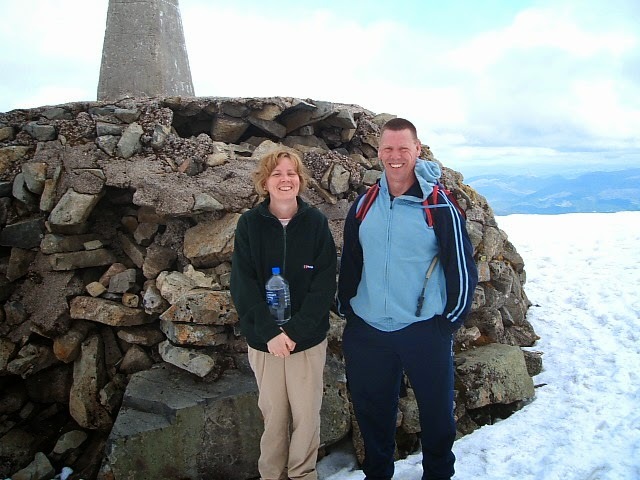 walked up from glen Nevis visitor centre.great views of 100 peaks nearby. An absolutely amazing hike up with P61, breathe taking views in glorious weather. 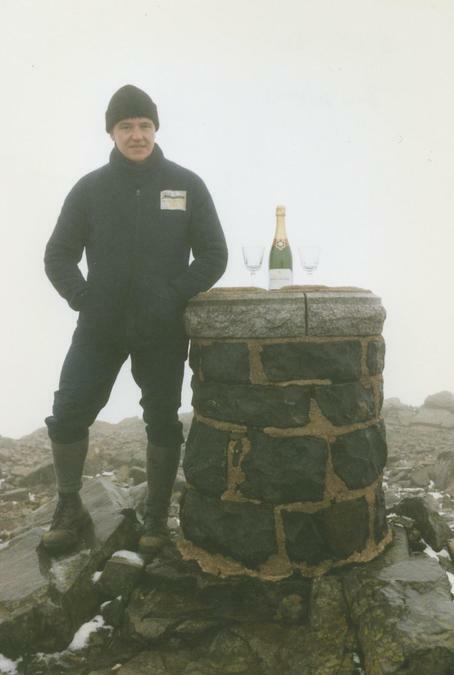 We started out from visitor centre 4hrs 15 mins to summit,we celebrated with an 18yr old Glenffidich. Revisit on a trip so mate earby rambler could bag this iconic summit.The weather could not have been better as we walked the long trail to the summit in shorts and a tee shirt.Had to queue to bag the trig which is in not bad condition considering its where it is.Spent quite a bit of time exploring the summit this time awesome long range views on offer today . Solo but not alone! From Glen Nevis Visitor Centre up the tourist track & back. Took me about 6h:45m. A beautiful clear day with amazing views. A tad busy even on a weekday. Unbelievably sunny day for the first climb of the 24-hour Three Peaks Challenge. 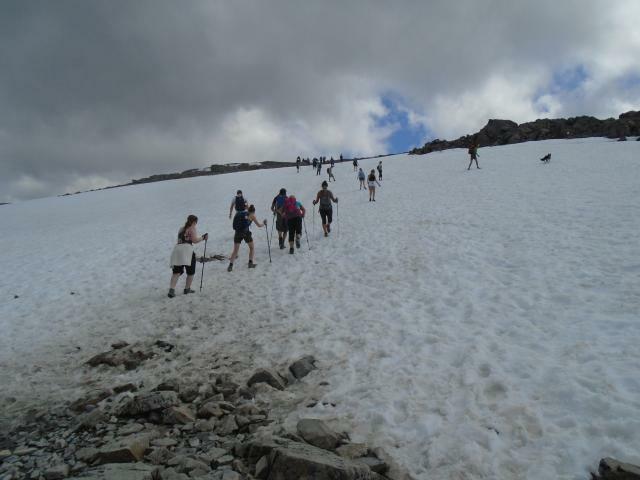 Still a few snow-fields on top which made the going quite difficult. Amazing views! Cracked it in 5 hours 10 mins which was pretty good going, then stuffed my face with chicken drumsticks before dozing on the bus trip to Wasdale Head! Actually my 4th trip up; the first being on my Father's 40th birthday in 1974. Happy Days! 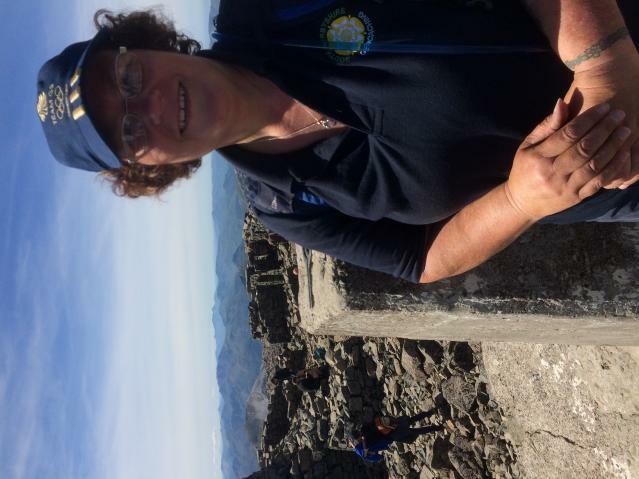 climbed via tourist path for charity challenge. Been here twice, both times no view due to low cloud. Very busy up top today. 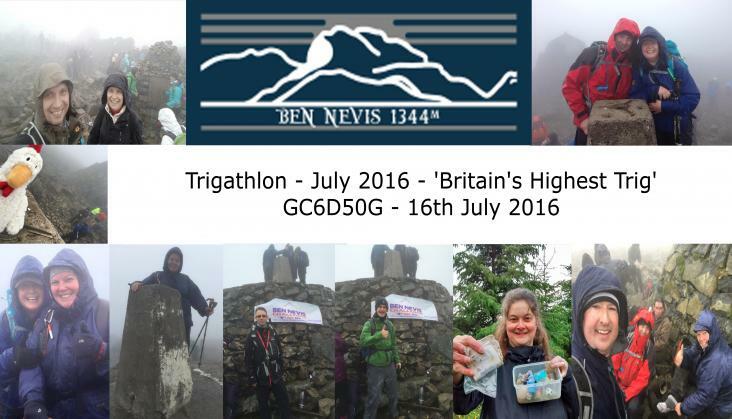 Well we picked a day that every charity event in Scotland decided to climb Ben Nevis. It was like doing a charity conga up the side of the mountain. 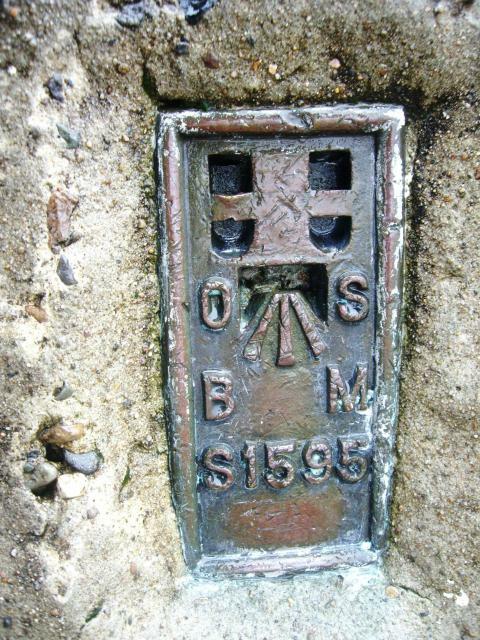 It was a tough slog from the YHA bridge and even tougher once on the main track. 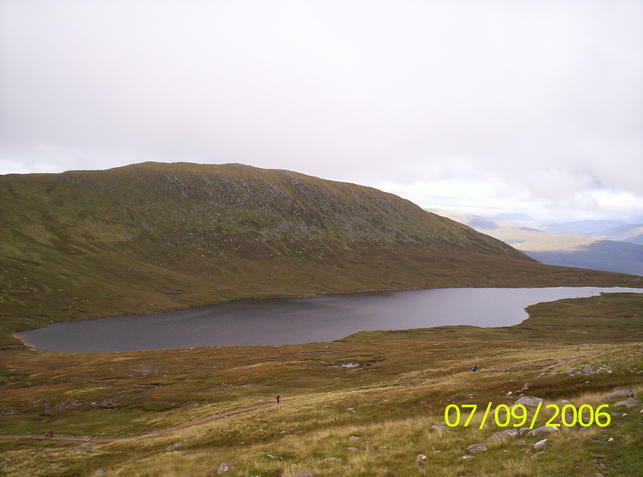 Lovely views to the Loch once we ascended above it. 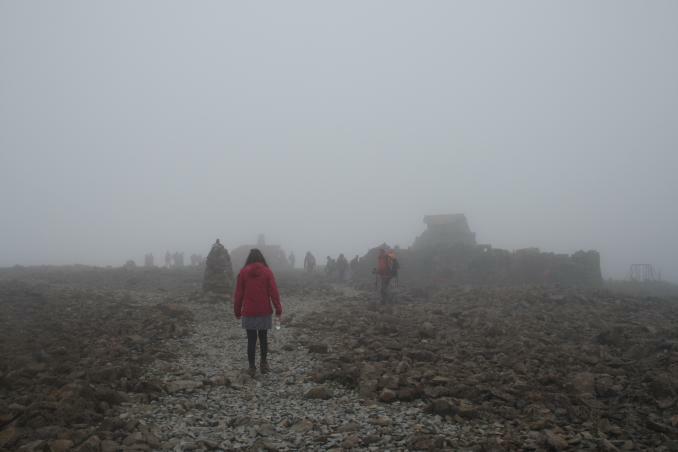 Then we hit more zig zags and after we crossed the waterfall, it was into the mist and following the track steadily uphill as these wee cairns jumped out of the mist. 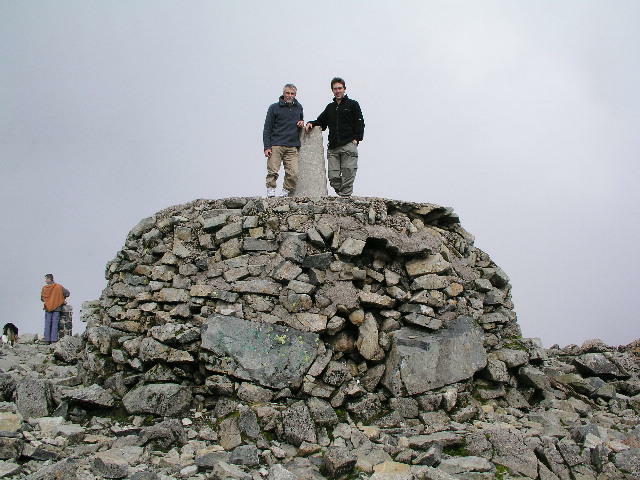 Then we were eventually at the summit. Took some time to explore and get some photos. 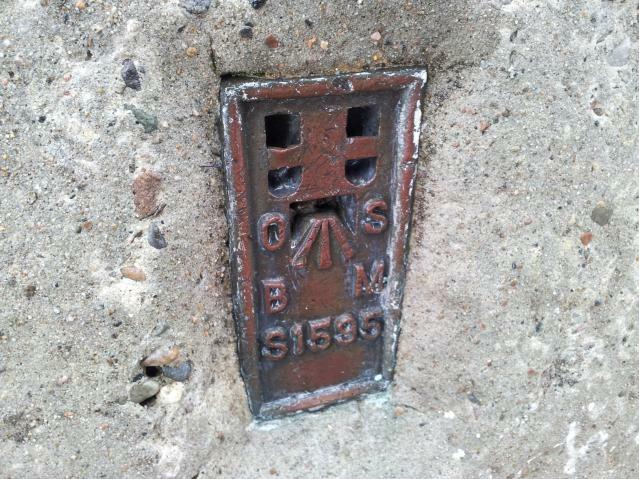 First time I have had to queue for a trig point. 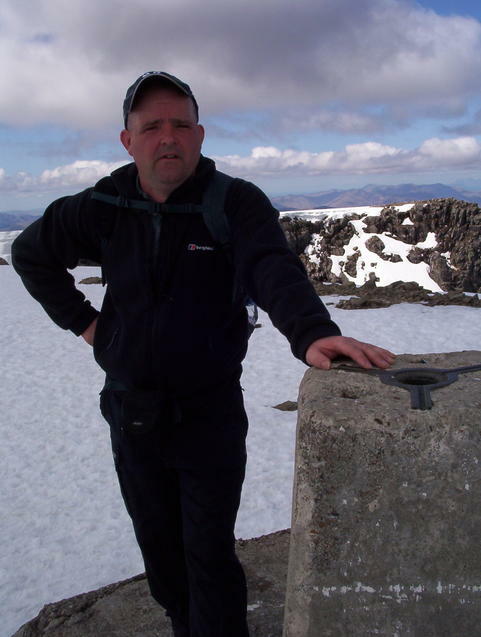 Great fun and Britains highest virtual. . Cheers. Tough climb up to this, took 4.5 hours for Mrs TJR, Mr TJR in 2.5. The hill was very busy today with many charity events. 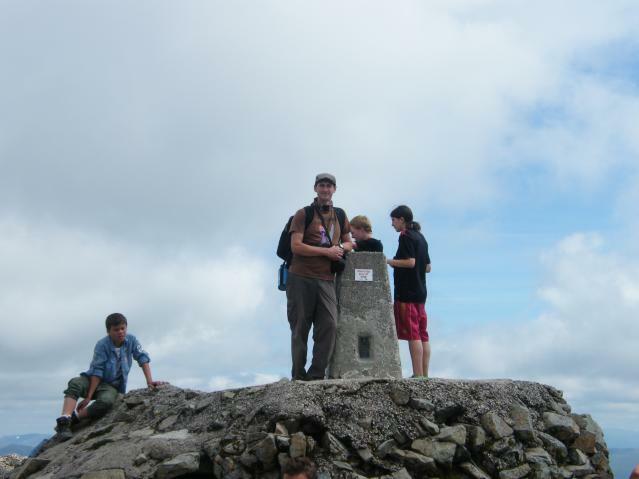 Had to queue to touch the trigpoint! 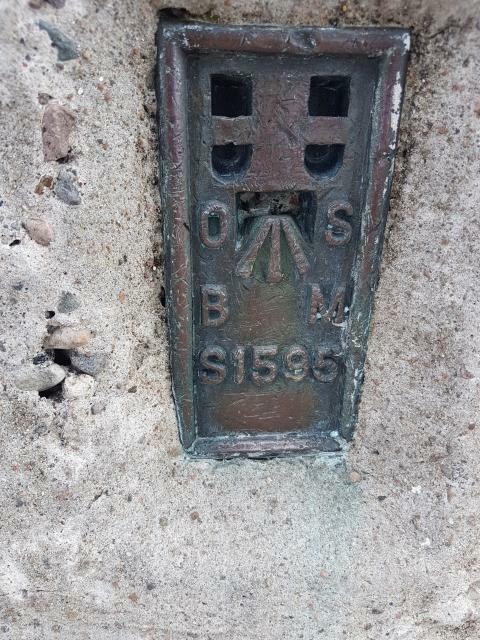 Nearly as long down for both of us but so happy to have this one in the bag, especially in the 80th year of the trig point. 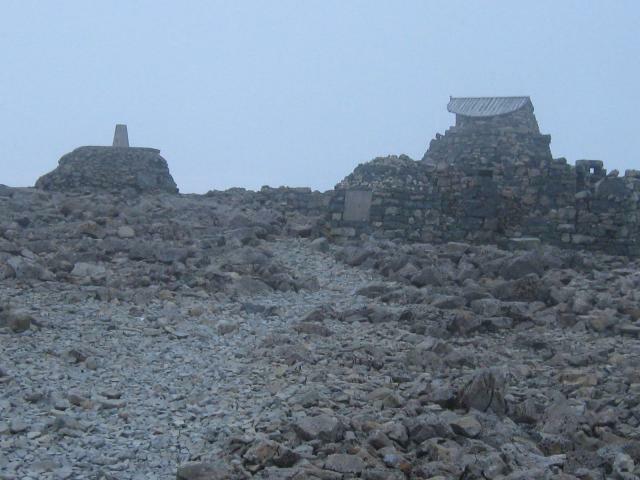 Cloudy and cold, but that much was expected from the highest peak in the UK. 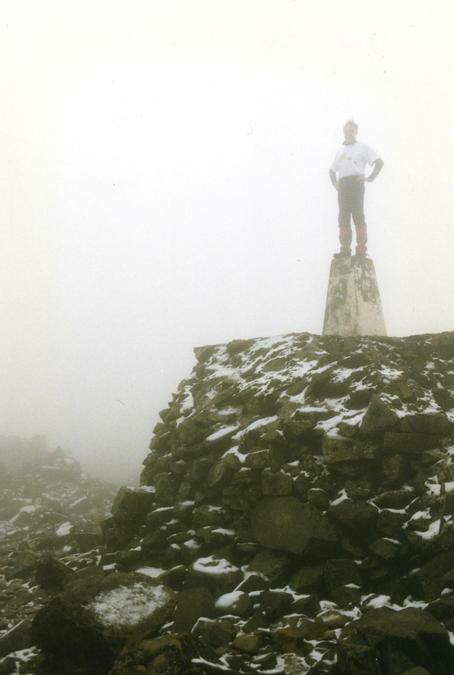 Ben Nevis trigpoint Me standing on top of the pillar. Old pillar Old pillar concreted into the side of the steps leading up to the current pillar. 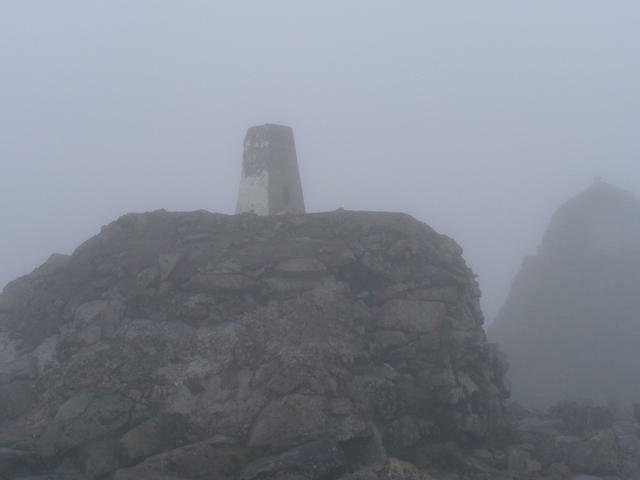 Difficult to see until on top of it due to poor visibility and cold. 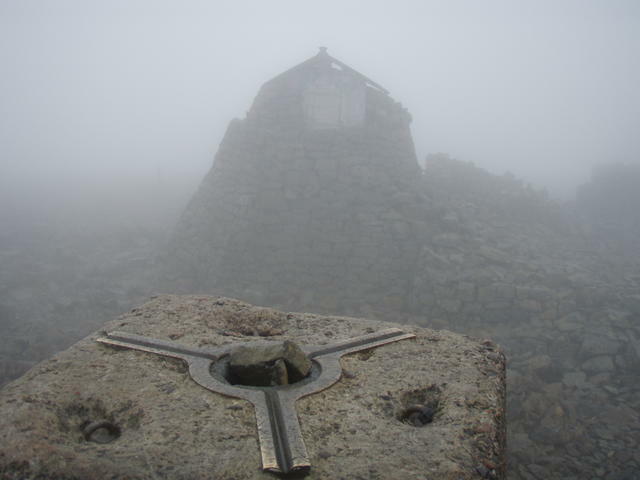 Unfortunately can only give 7/10 for view, joined the masses who visit this trig when the cloud cover is low and drizzly. Good clear day at base with great views until the last 400m. Snow still on the ground just short of the summit. Believe good visibility on only 10% of the year. Trig condition hard to describe as limited time to examine due to masses of people milling around area and poor visibility. Appeared in vgc which is unbelievable due to number of visitors and exposed position. Cap missing and spider polished by the touch of many hands. 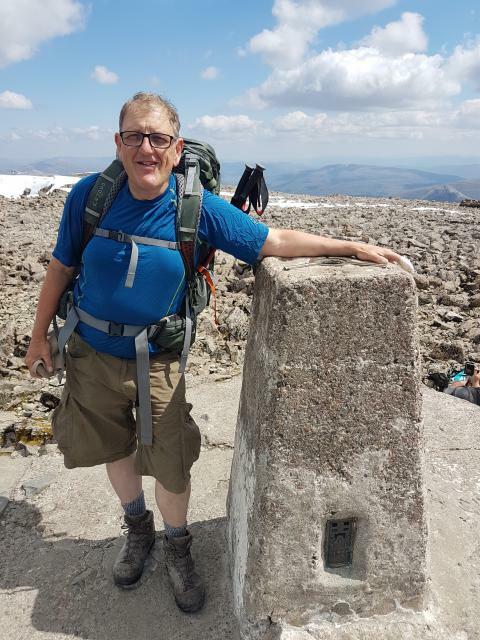 Walk easier than expected - 3.5 hrs up, 3hrs down, average they say but well pleased and great way to end week after walking West a Highland Way with our daughters. 6 hours round trip from the visitor centre, good views most of the day. 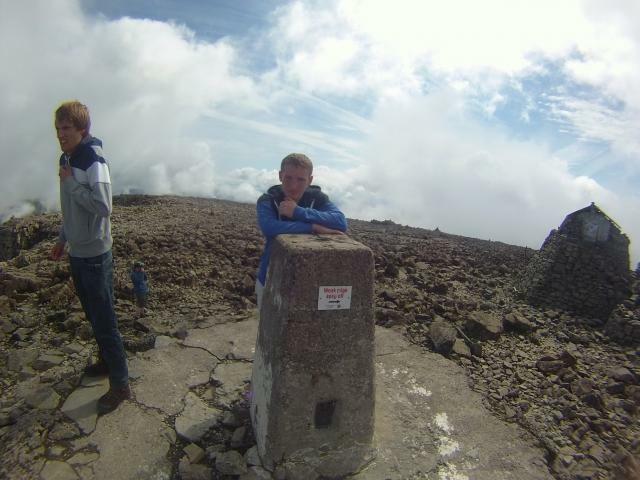 Summited in 3 hours 47 minutes. 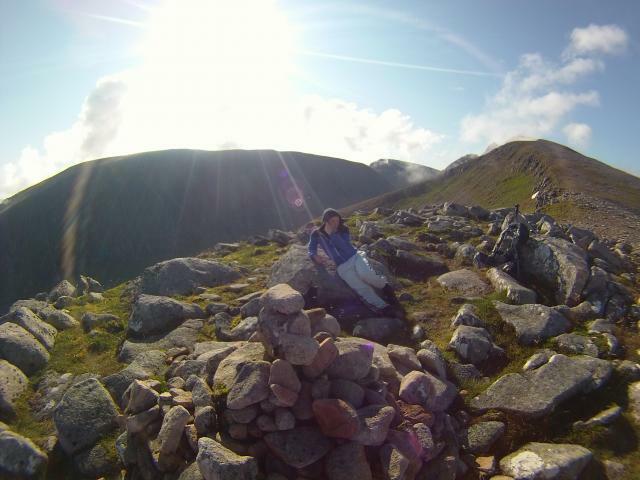 11/10 - wonderful day to climb the Ben, sunshine, blue skies and fantastic views. I think I could see the mountains either on Mull or Skye. Great end to a great holiday. 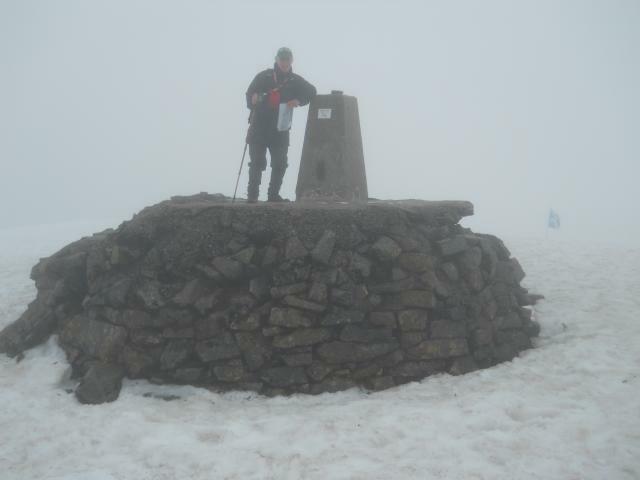 Solo ascent as the Old Man's mountaineering ambitions were satisfied by Ben Lomond - up in 3.5hrs, not bad for an Old Lady from flat Hampshire! Down in 2.75hrs, which seemed the harder of the two journeys (but at least the Old Man had a pint lined up for me at the Ben Nevis Inn!). Every man, and a few dogs on top; most notable being a very fine Dalmatian (fortunately the other 100 were elsewhere), at least 50 U.S. Marines, complete with radio comms (v reassuring) and a group of (adult) German scouts in kilts! SE s/hole, and centre, open, but otherwise in surprisingly good condition, considering the combined attacks of man and elements. 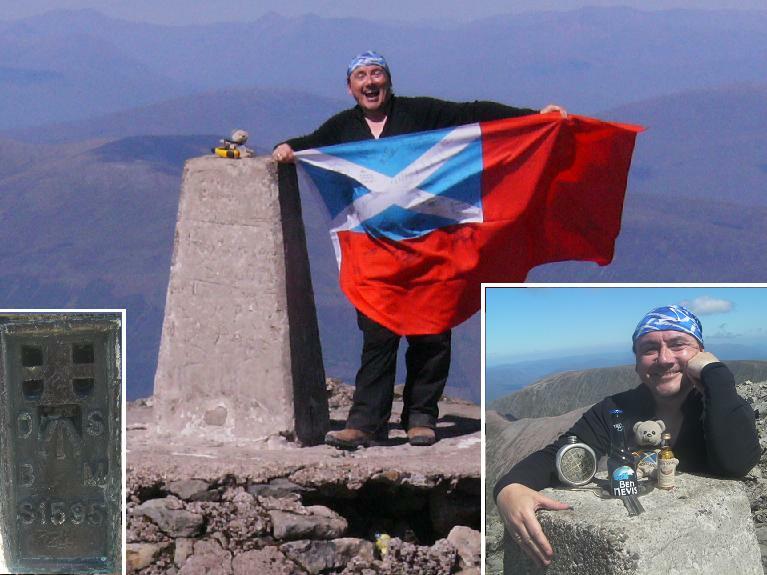 3rd of a 3-trig mini tour of Scotland. I'd been watching the Met Office website for ages to get such a stunning day for it. Damn it's a long slog of a climb, but damn what a view! Sitting at the campsite later i saw the Search and Rescue helicopter up there. Merciless place. Visibility ZERO, 3ft of snow in July. 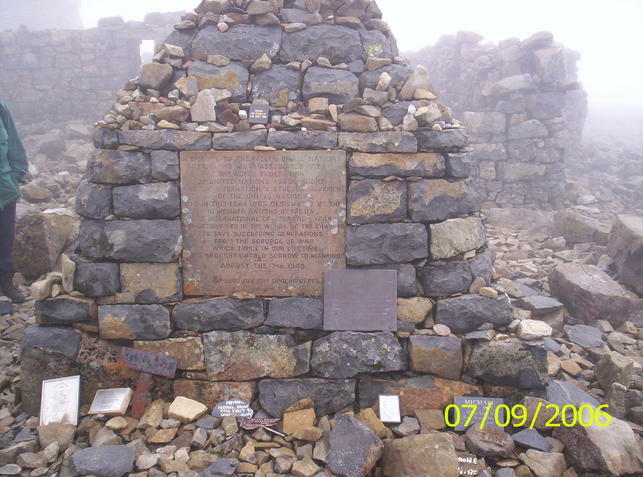 Scary experience, life lost up there the same day very bed weather over 700m. Massive sense of achievement and a very fun rewarding day in all. 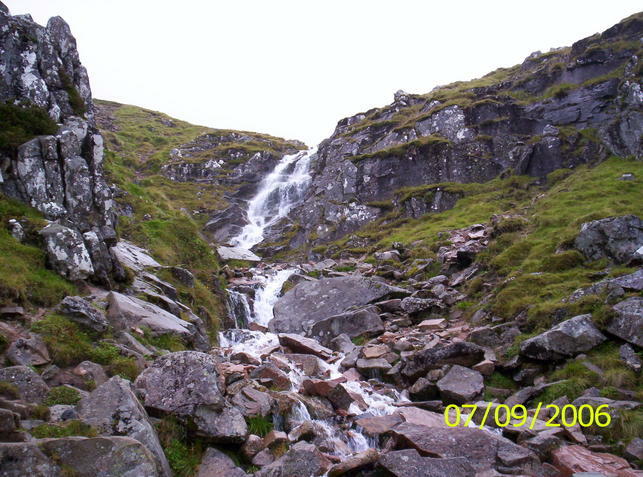 Even had time when we'd done to drive up to the fairy pools of Skye and do a little 5 miler round there. 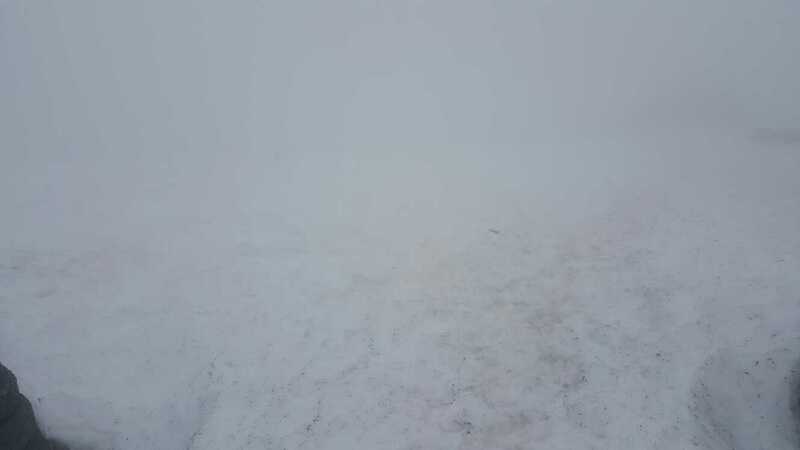 Trekked up again but this time the summit visibility was only 50m (misty) & snow with compacted ice, with a strong wind making for cautious progress. 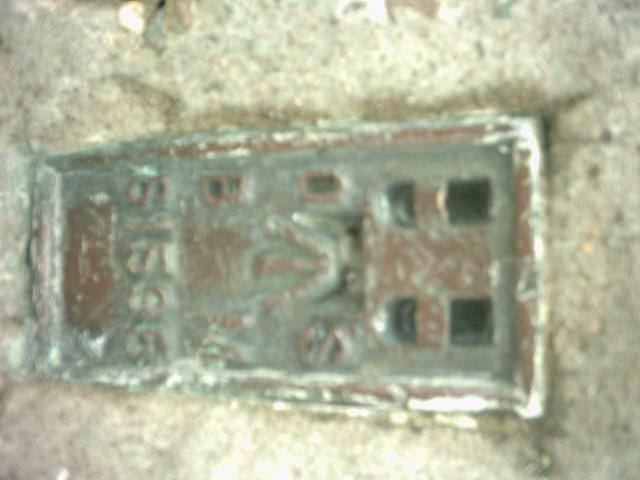 Some damage to the side of the supporting mount. Waited all week for weather to be reasonable. Finally on the Friday was good enough. 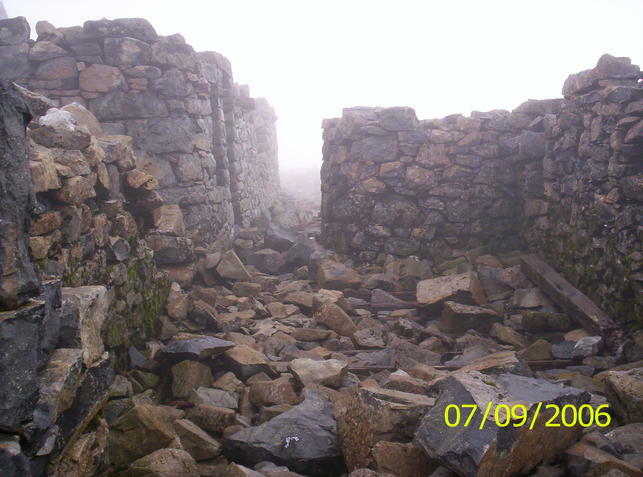 Hard slog to summit where snow was travelling horizontally and visibility about 30 yards.Surprised to see remains of a building. Then endured a wet and slippery descent. Saturday and reasonable weather, so there was a good number of people and didn't stay long. Cloud base about 1100m so no views from top and very windy. Some fantastic views on the way up (& down). Really hard slog for an old'n. Fantastic 360 views today, because its good weather there are loads of folks. 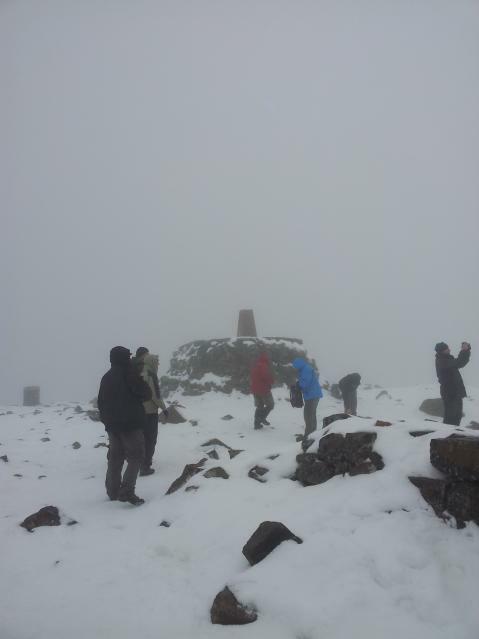 August in Scotland so snow and mist at the summit and -3. Well worth the slog though. It was a really hard slog to get there but we managed it in the end whilst visiting the area specifically for this. 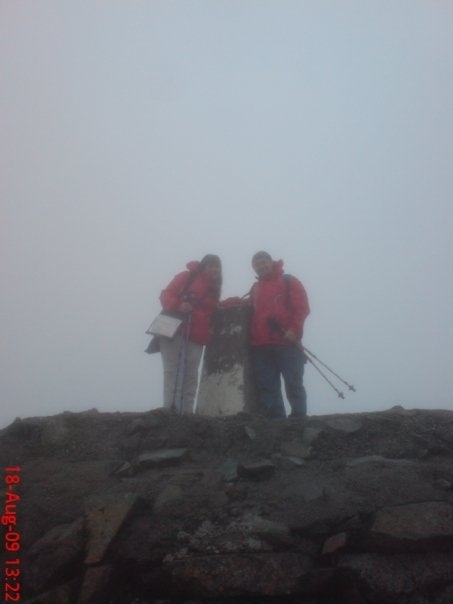 Visibility was really not great when we got up there but it didn't decrease the sense of achievement. 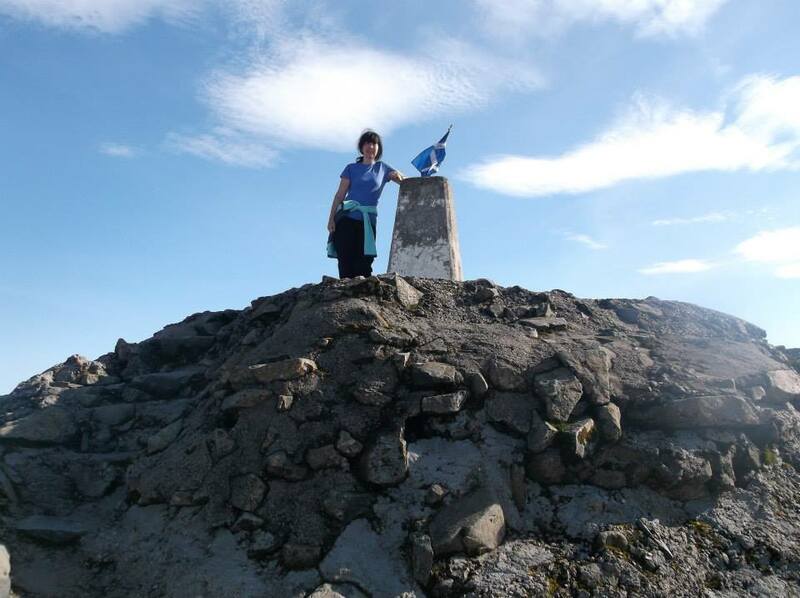 I haven't walked up a mountain for years - so of course I have to Britains highest! 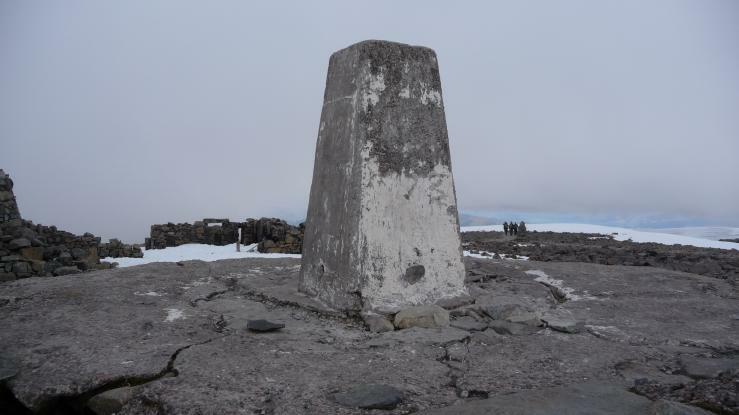 Me and Connor visited this trig after first climbing Carn Mor Dearg then climbing Ben Nevis via the North face and via this route it gets a score of 9. 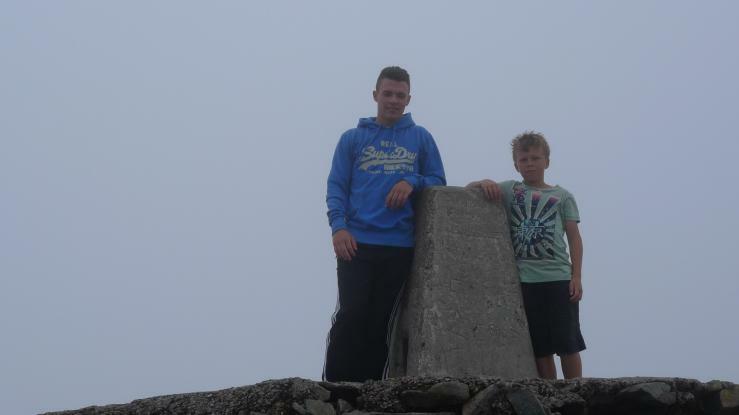 Connor Connor on the summit of "Carn Beag Deag" on our way up Ben Nevis via the CMD route. 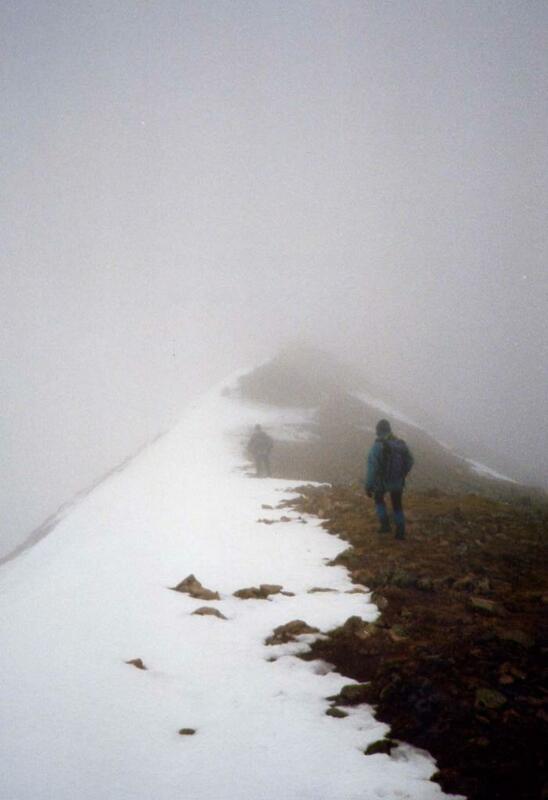 On our way to the Trig This is the view of Ben Nevis you do not see when you walk the tourist route. 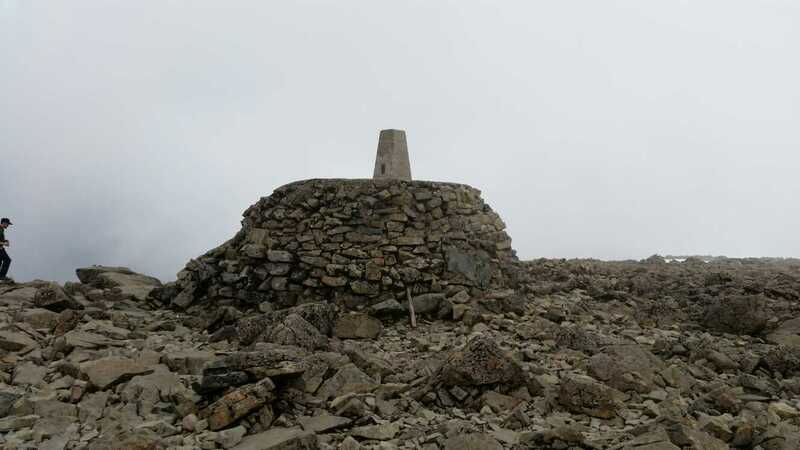 Walked up main path to Ben Nevis, we thought we had to bag this one after bagging Little Ouse (the lowest trig), when we started it was sunny but it got cloudy with little few second gaps in the cloud to see the view when at top. 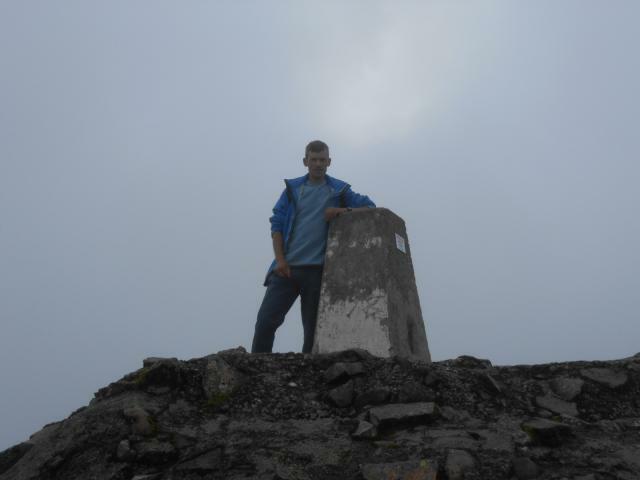 Bagged Beinn Dorain and Beinn an Dothaidh the day before and Broad Law and Culter Fell the day before that. Lucky with the weather, superb views all round. 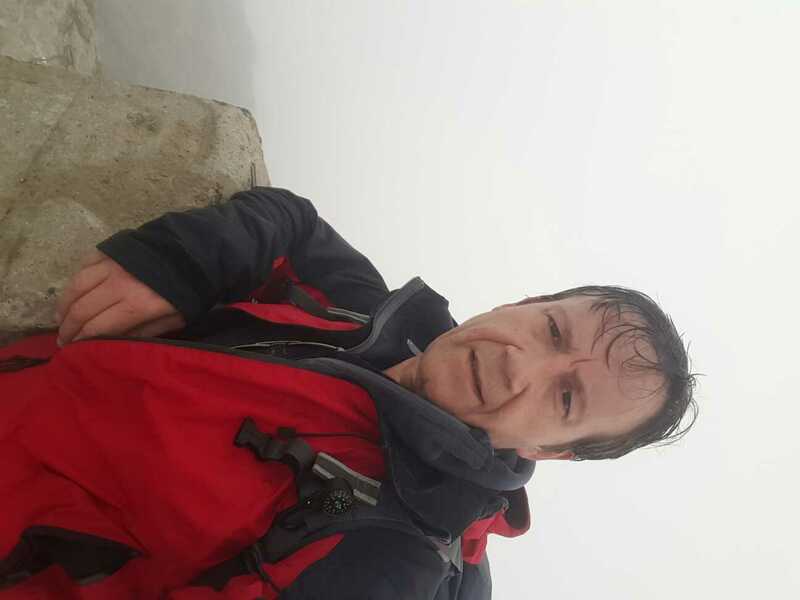 Found on a misty afternoon after climbing up via the CMD arete route. 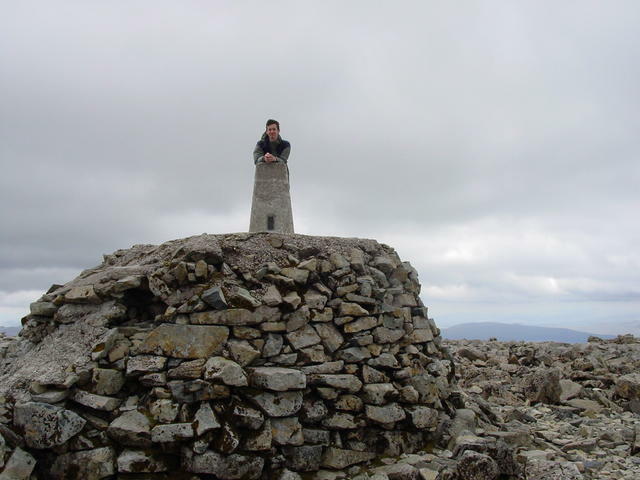 This must be one of the most visited Trigs in the list. Queued to have photo taken. 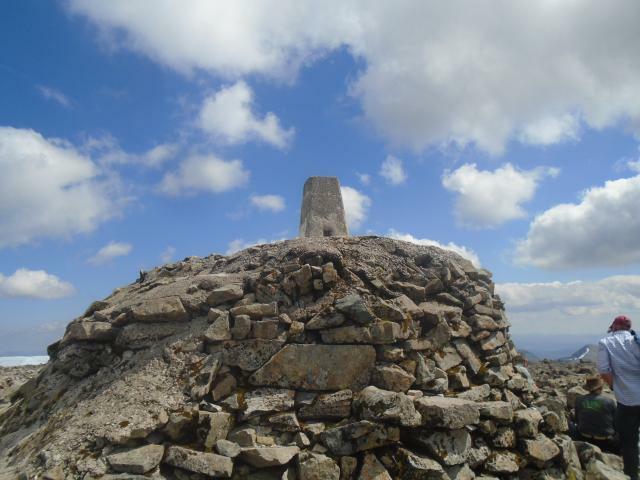 It has to get a 10, highest point in the land and we got the best weather and views ever! 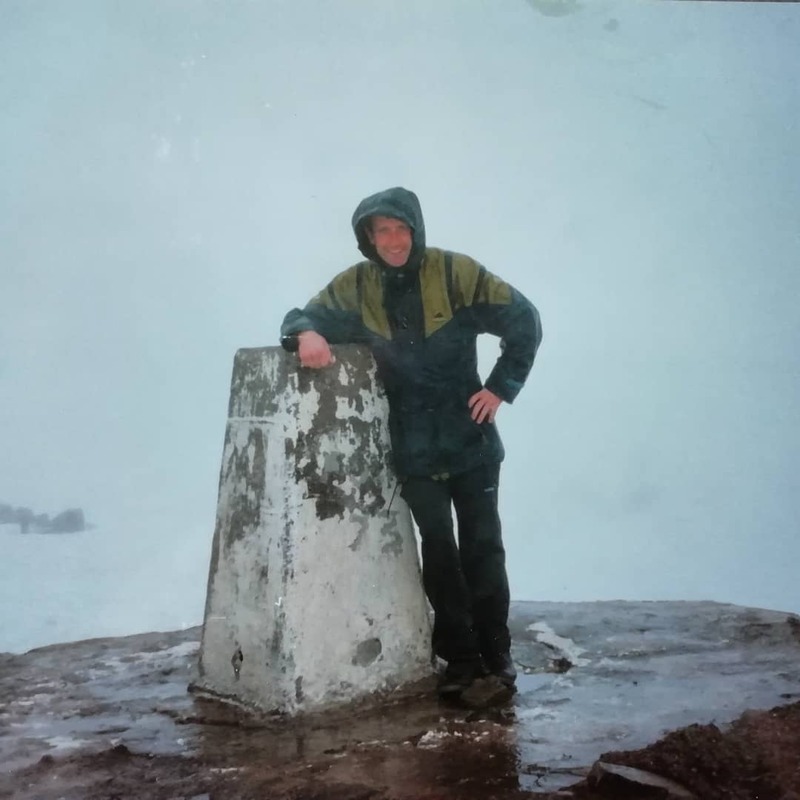 31 years and 16 days (11340 days) after I first climbed Ben Nevis aged 16 with my parents (see entry below for 28/07/1982), today I accompanied my boys, Charlie (16) & Harvey (12) to the summit. Very similar weather, sunny all the way up and down but misty and cold on top. Came up the mountain road, in cloud from 600 m but a few bursts of sunshine at the top. Lots of French, Germans and Americans sharing the summit the day before my 30th birthday. Super photo of Sophie The Giraffe & myself nonchalantly posing against the pillar, but Sophie declines to have this picture published - shame. 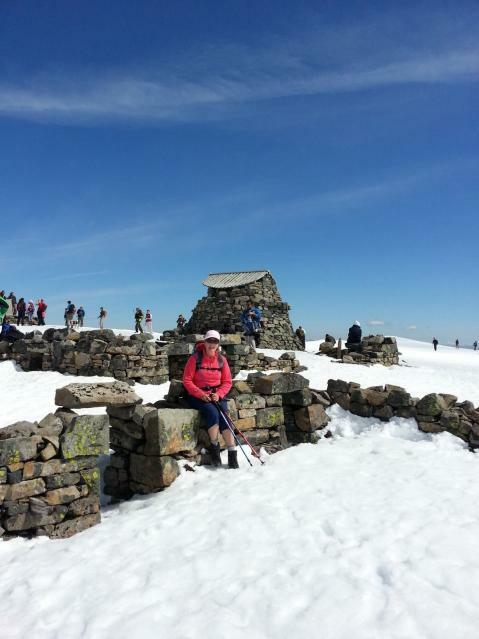 Is she the first giraffe to climb Ben Nevis? I think so. 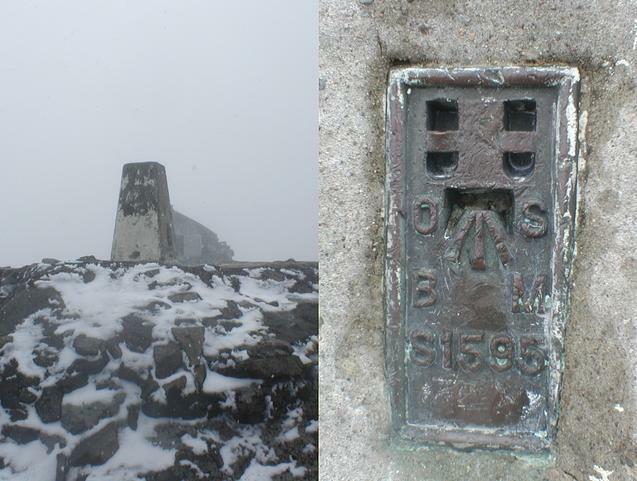 Wonderful day for climbing, misty at the summit, and strange (for me) to be crunching my way through snow in June. Perfect day. 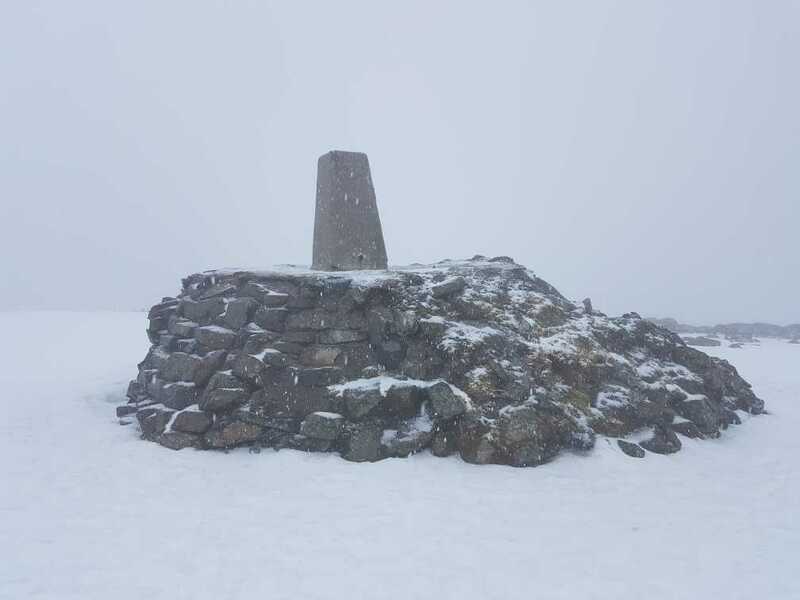 Ascended via the tourist route with compacted snow on teh summit and poor views but 10 for thr fact that it's the highest in the UK andn the surrounding beauty is evident lower down. 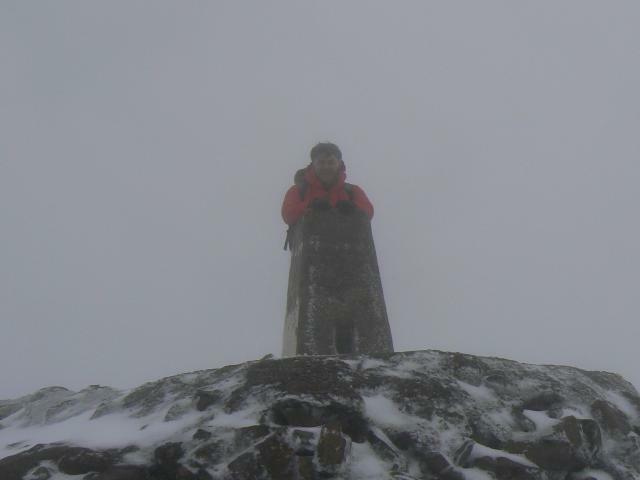 On the remains I front of the trig! 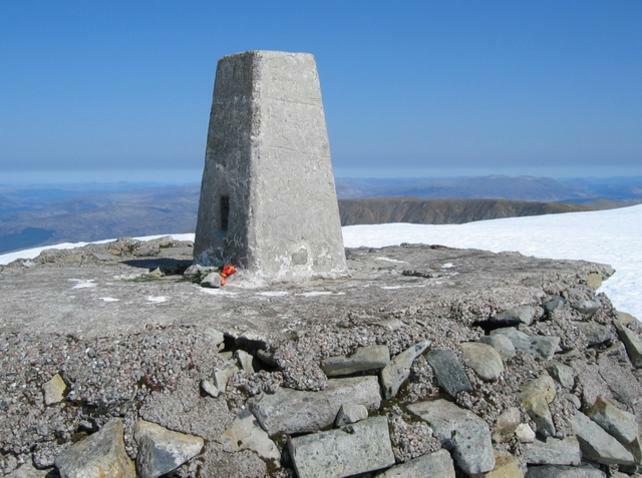 Perfect day to climb Britain's biggest. Sunny and icy cold on top. A tough, steep climb but definitely well worth the effort. Views were breathtaking, snow capped mountains everywhere you looked. Ascended by the 'tourist route'. Maclean's Steep section was hard packed snow, iced over. Sadly, no view from the top - hence 5/10 score. 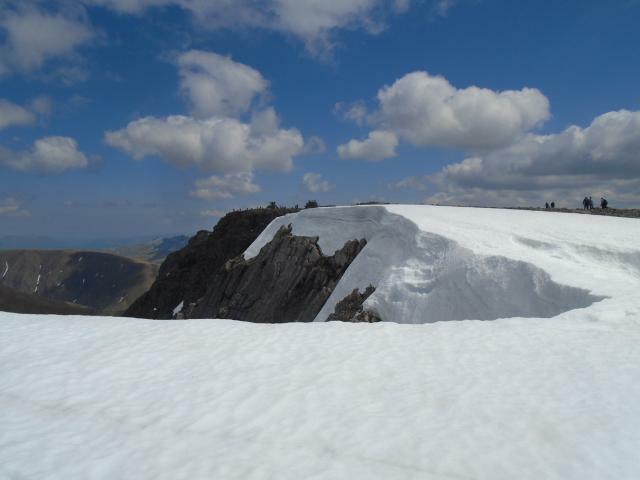 Descended the same route but avoided icy bits by keeping to the cairns where snow was softer. Great long walk up with great views all round. 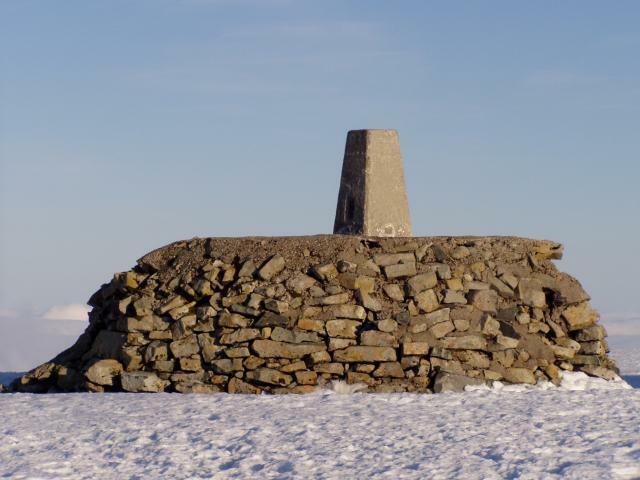 A beautiful clear day at Britain's highest trig. Visited while competing in the Three Peask challenge. Revisit. 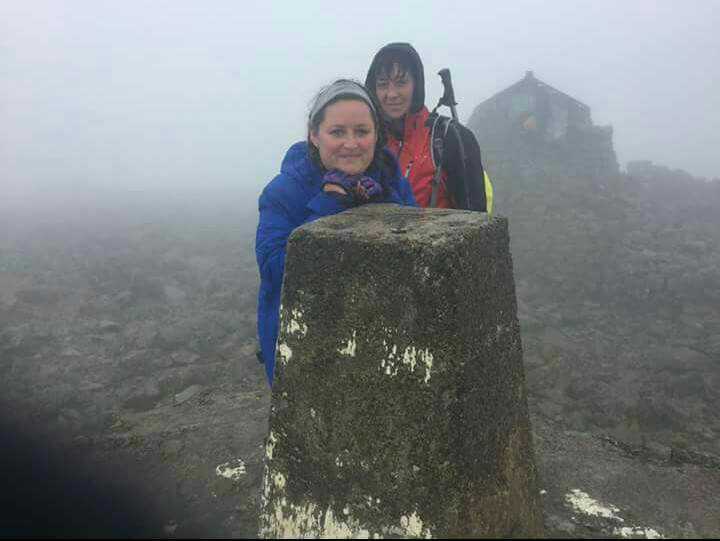 My sister had a significant birthday and wanted to *celebrate* by going up Ben Nevis. 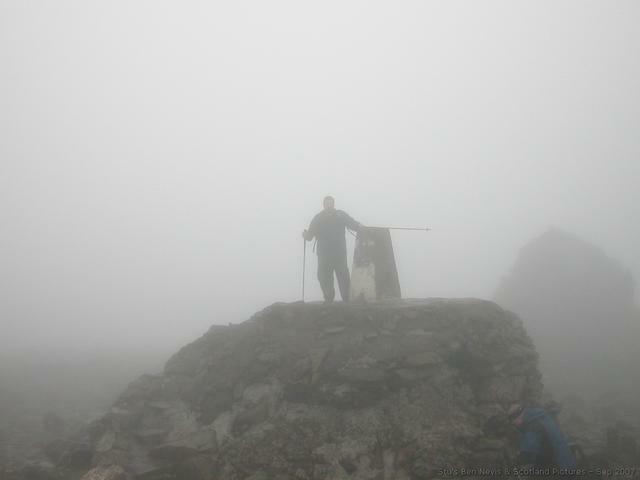 Very few people at summit, mist so thick you couldn't see folk anyway! Planned route via CMD arete went a little wrong due a lazy bit of navigation so ended up scrambling up the corrie to the southwest end of the arete. Good fun but disappointed at missing out on traverse of the arete itself. 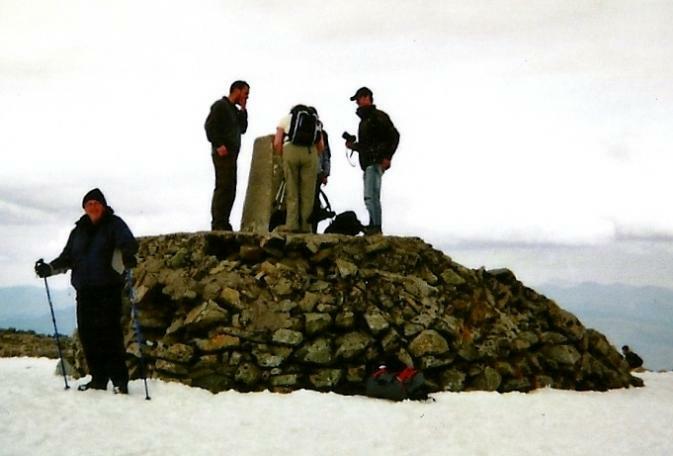 Ben Nevis summit was swarming with people as you'd expect. Clear of cloud but views very hazy as the rain was heading in. Mayhem on top. Torrential rain, sleet and thick cloud. Not of the better days on the hill. 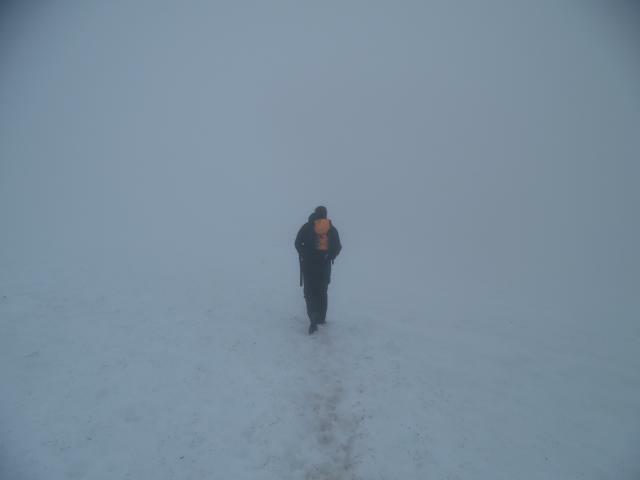 One hell of a slog, as is usual nil visibility... still snow up here as well. One day I'll be here in decent weather. Driving rain/sleet, -4C. 5th time and never yet in good visibility. 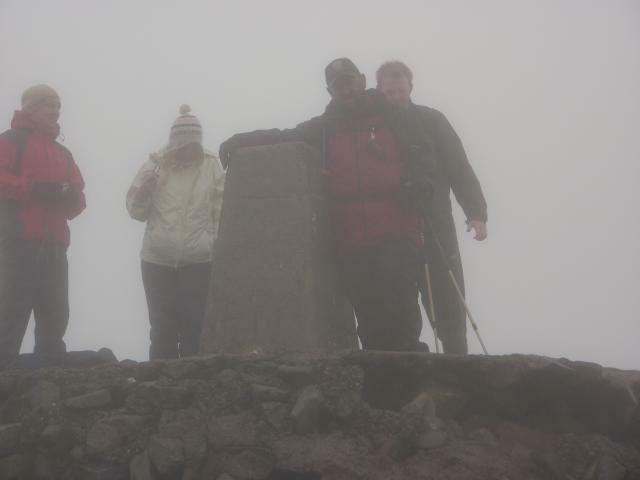 Summit in cloud, cold and wet, but a good day out. scenery 5 as visibility reduced. 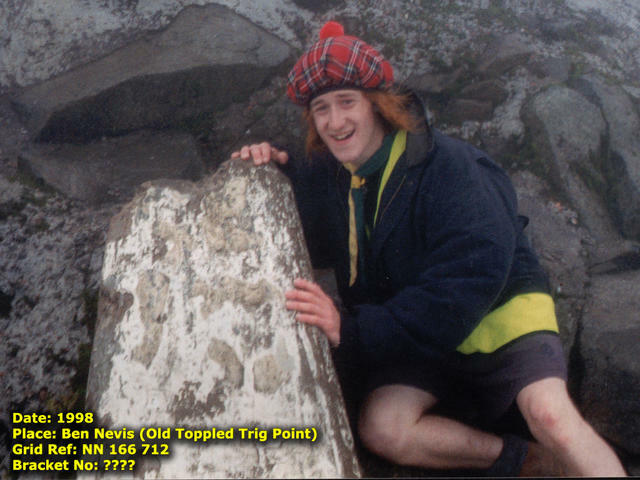 Highest trig in UK, the Pinnacle of bagging. Cap missing, weathered a bit with only NorthWestern sight open... neat to see the ex-pillar forming the first step to the platform! 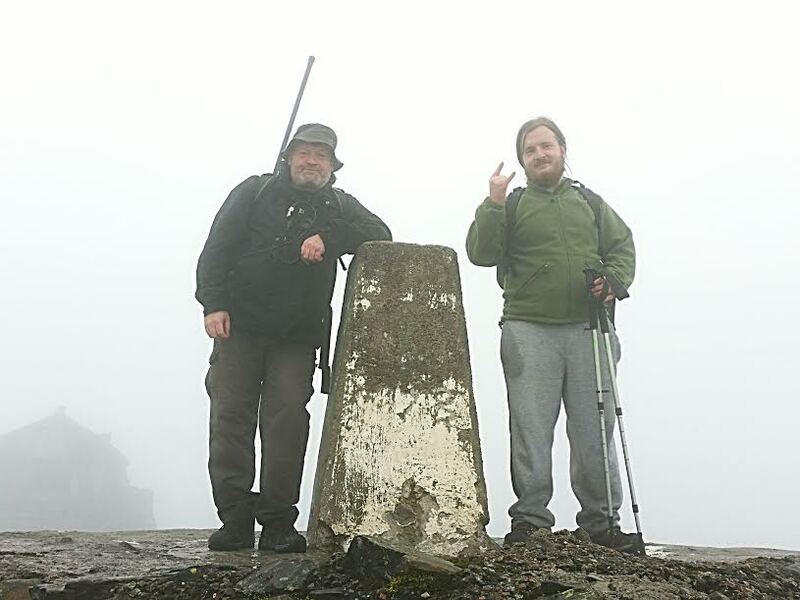 Bens first Munro - my first with brother Trix. A stunning day, rare saunter and fine wee dedication to Momma on her birthday. 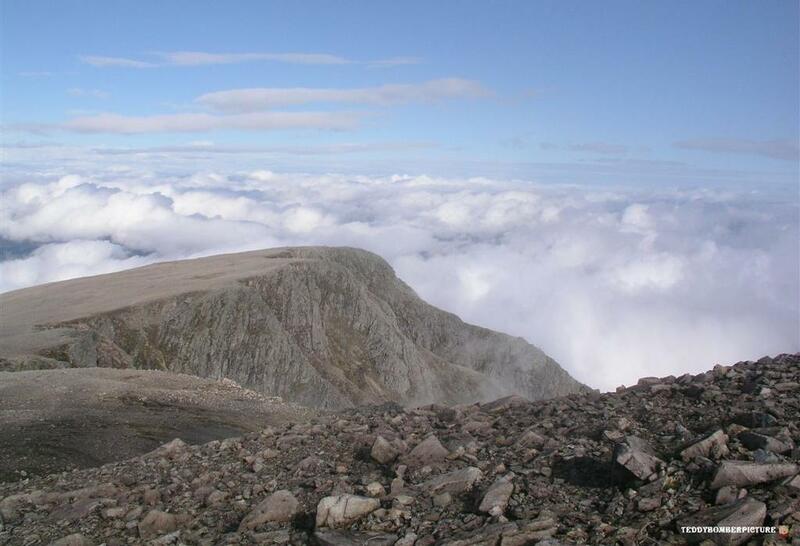 Ben Nevis ..on one of those rare beautifully clear days! Unknowingly this was my first trig. Retrospectively claimed in June 2018 at the start of my interest. How embarrassing is all this rubbish up here? Disgusting. 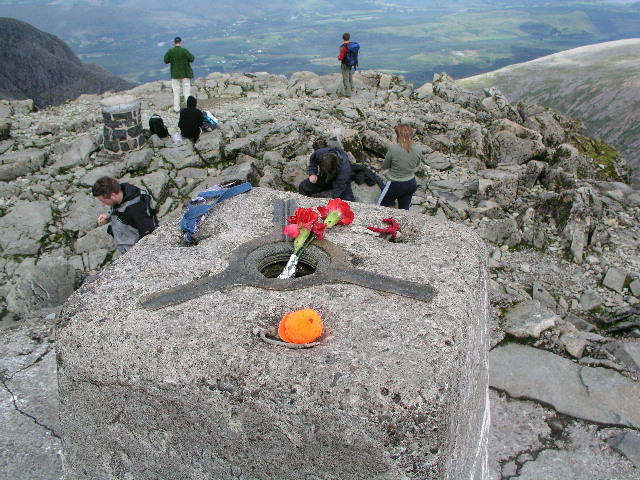 Ruined the lovely trip up via the CMD arete. Ascent of Ben Nevis from Glen Nevis, Carn Mor Dearg and the CMD Arete with a multigenerational party consisting of my brother, nephew and father. Poor visibility today, very pleased to bag this one. 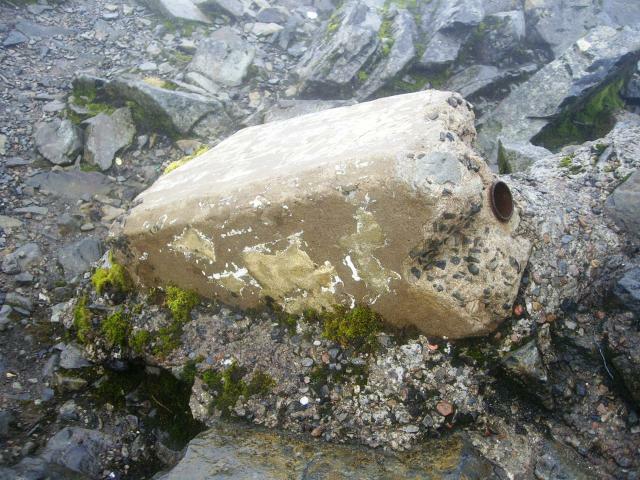 Found on a very wet and misty ascent of Ben Nevis whilst attending the Perth MEGA Geocache Event. 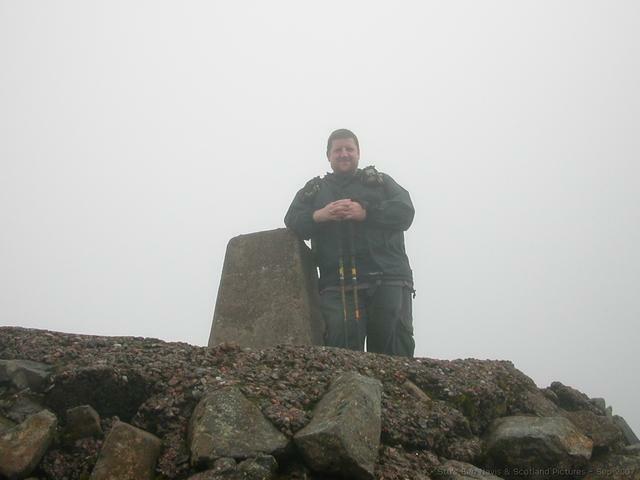 This is my very first Highest Trig wow what a climb but worth it even it was foggy and cold. We climbed the Ben with a group of geocachers as part of the events associated with the Mega Event that was to take place in Perth later in the week. Went up the tourist path (due to vertigo) - much, much easier than Aonoch Mor via Steall yesterday. Bit cloudy when I arrived but stayed for nearly two hours (despite being about freezing). Cleared quite well, so views worth waiting for - hazy in distance. First time here for about 40 years. Area covered in cloud but great to visit. For us, this has to be a 10 out of 10. 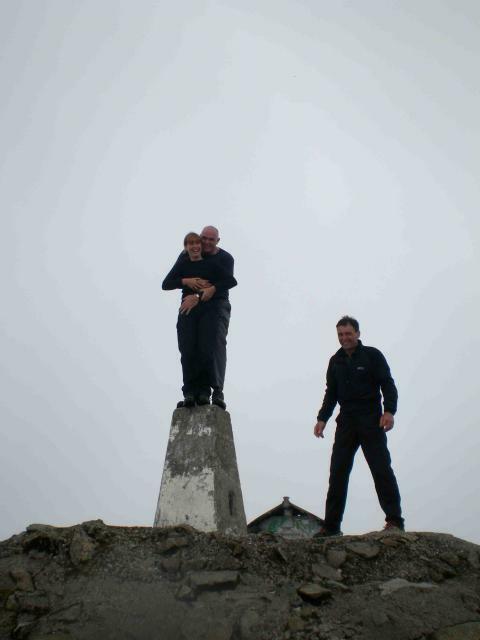 Its the pinnacle of standing on top of the world to us. 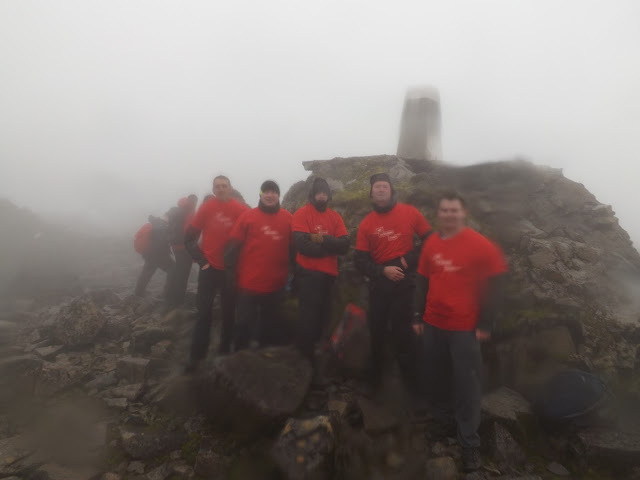 After a 4 hour hike as part of a charity climb for the Anthony Nolan trust we reached the summit. Good weather all the way up to end of the zigzags, then became a little cloudy. 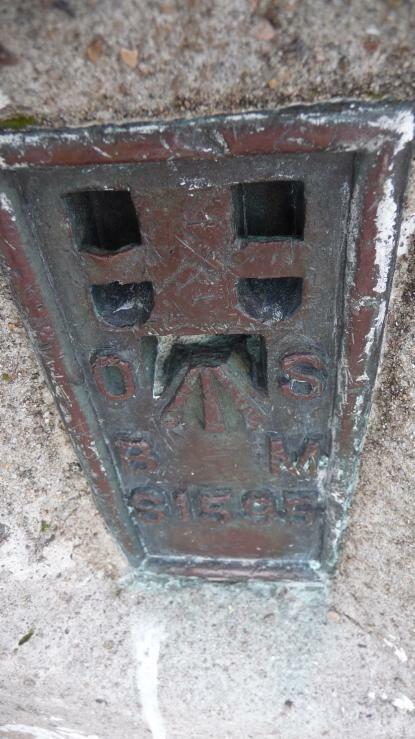 The trig is in good condition considering it location and public accessibility. Cap missing, previous trig pillar visible as you climb steps to this one, which was interesting to see, we wonder when it was replaced. 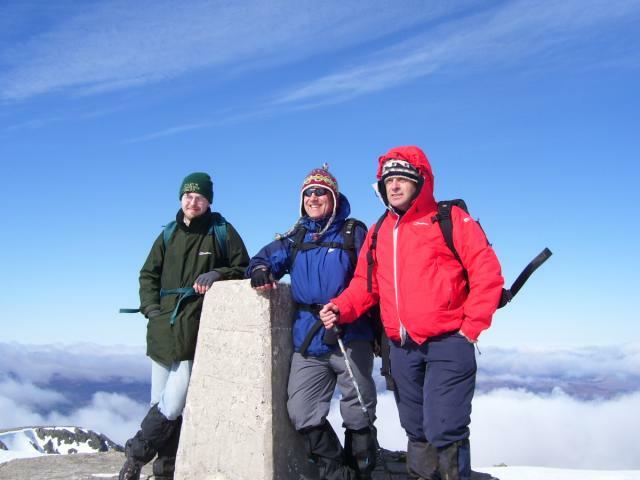 Our pictures includes our mountain leader Brian, who we are forever grateful too, and is a credit to his profession, Thank you Brian. Clear blue sky, calm, nice powder snow and not another living soul to experience this snowy wonderland on this Christmas eve to remember. 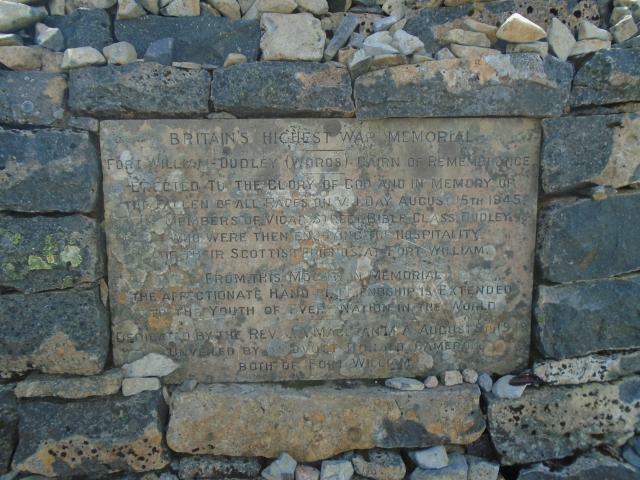 First visited this highest point of the British Isles 11/04/69 and many,many times since but none more enjoyable than this one, 40 years on! 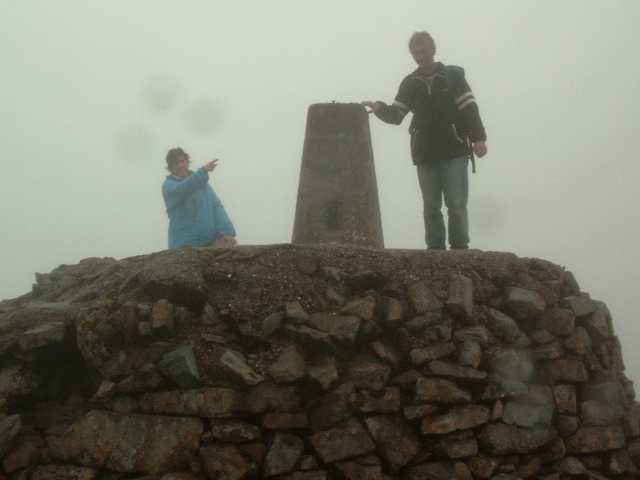 After along windy walk to the summit we were also disapointed, that we did not get to see a view from the top of the Ben due to the Foggy conditions. We were very lucky, beautiful day, could see as far as Northern Ireland! Hard work on the scree. One of the better days... sunshine and a decent but hazy view. Fabulous place, mostly good views but occasionally obscurred by cloud. Still a fair amount of snow about. Good grief...how many times have I been up here...well, 47 actually, including my best time of 2 hours 13 minutes up and down from Achintee Farm, and a creditable 2 hours 27 minutes in the Ben race way back in 1980....takes a bit longer these days. 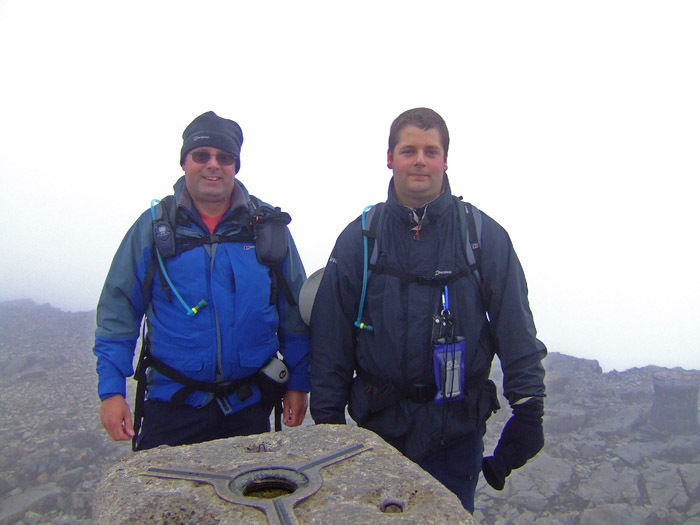 Climbed via Carn Mor Dearg arete. This was the big one, could only give it a 9 because the last 400ft was in the clouds. If I climb it again it will be on a clear day, then I will give it 10. 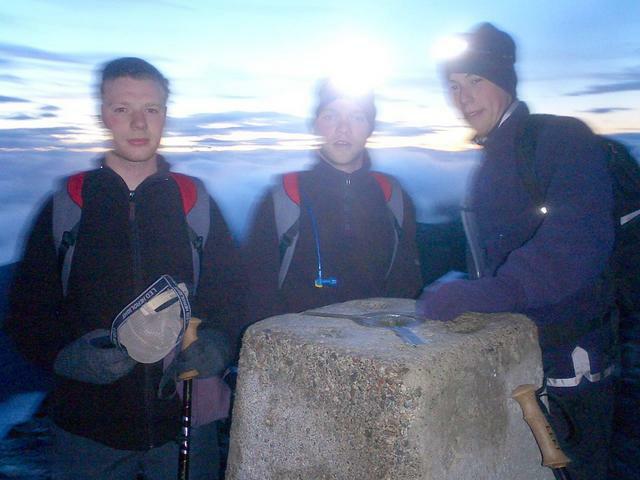 It was the hardest Trigpoint we have ever logged. Took 6 hours to climb (which was OK), took 6 hours to come down (which was hard). All those rocks and boulders took their toll, Chris bruised all her toes and my knees were on fire. The pains all faded next day when we realised we had done it. Surgeons Rib ascent from SW in Glen Nevis direct to col to Carn Dearg South, a thousand feet on main ridge we can see hundreds of people snaking backwards and forwards on the tourist path. It is August bank Holiday Saturday!! We cross the path and head out N to Carn Dearg N, my other target before finally heading to the summit which is thronged with people. 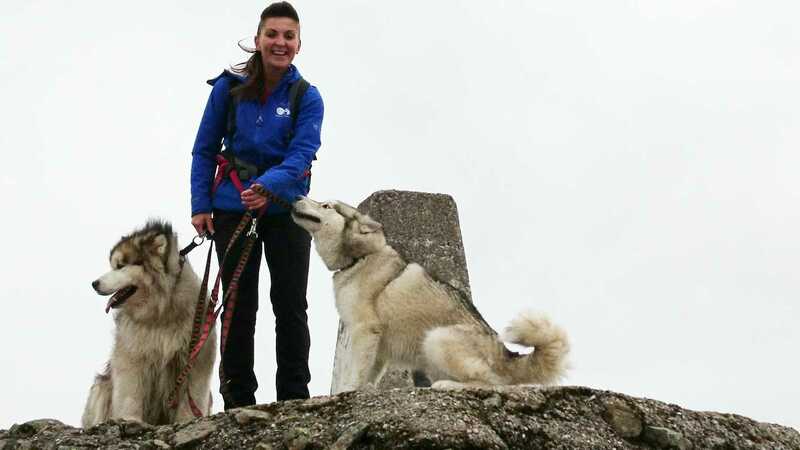 There's been a Jane Tomlinson cancer appeal sponsored climb among others clogging the mountain. Seems like a thousand or so may well summit today!! We head off along the CMD arete to Carn Mor Dearg before heading south in gloom and deteriorating weather the long way back to the glen Nevis valley. Jamie's first time. 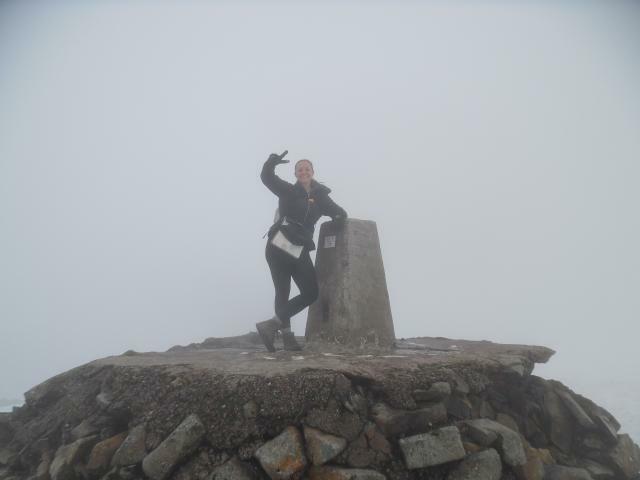 My third time up the Ben, 2nd on CMD. 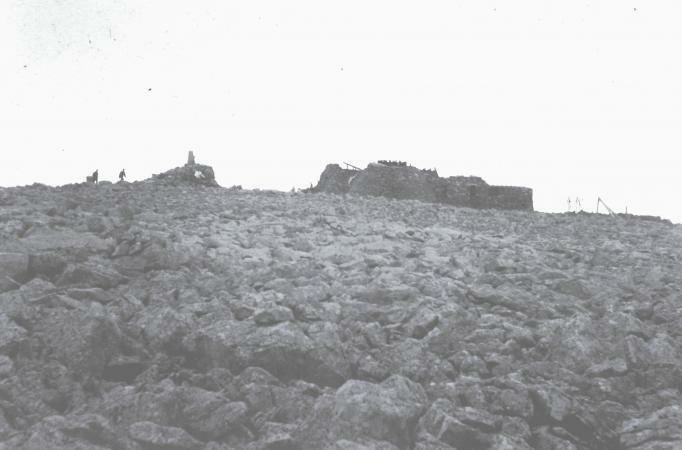 Second ascent, 1st 30th May 1978 - bought pair of crampons in Fort William & had to try them out. This time a superb walk from boat at Banavie. CMD arete and then down tourist track to Nevis Inn. Cloud from about 1100m. No view at the top - apart from the various monuments and other visitors. Still a few patches of snow about. Nothing clever - straight up (and up and up) the Pony Track (Tourist Path) from the Visitor Centre and then back down (and down and down) to Fort William for refreshments. Cloud from 3000 feet upwards today so no view but still a great feeling to be on top, some snow still about just below the summit. Nice and quiet too with just us and four other walkers, we had a quick sandwich and visited the nearby Geocache before starting the harder half of the walk! 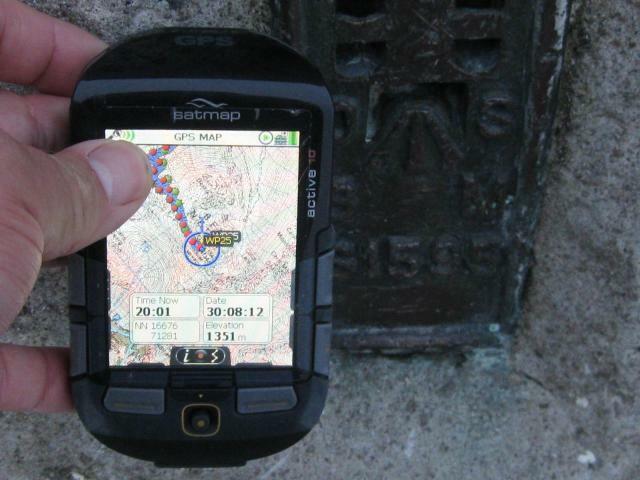 Found whilst doing a four peaks challenge with Cornwall search & Rescue Team. Snow still on the ground. We were unbelievably lucky with the weather, clear views all the way to the Isle of Java & The Black Cuillin. Busy on top as expected but managed to avoid most of the crowds by going via the CMD Arete, superb day! Set of in bright sunny weather but the temp dropped like a stone near top, started snowing.like the arndale centre on top worth the effort for clear views. We had a lovely clear bright day for this walk. Started off with the 'tourist route' until the half-way lochan and then plumped for the more difficult path around the north of the massive and up onto Carn Mor Dearg, across the arete and did the final assault from the east. Wow, was that was more satisfying than the zig-zag drudge with the masses? 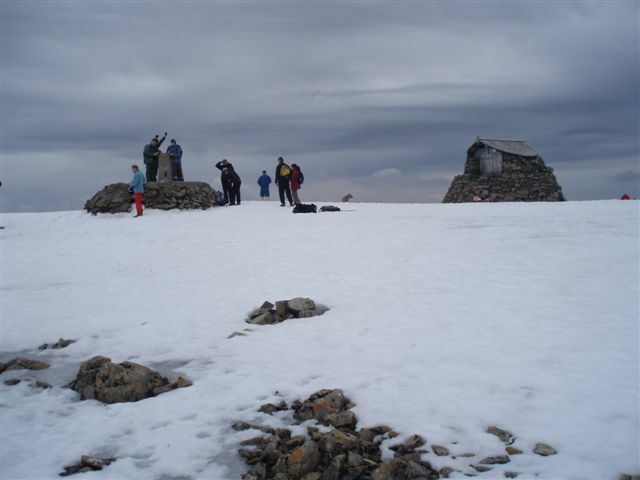 Summit plateau was packed - snow and people. ***Re-visited 1 May 2018 with nephew Andrew Purkiss. Over CMD and the arete again, this time a linear walk from North Face car park to Visitors' Centre. Cloud down on the hill and a blizzard passing through, no views. Adding my log to the crowd. 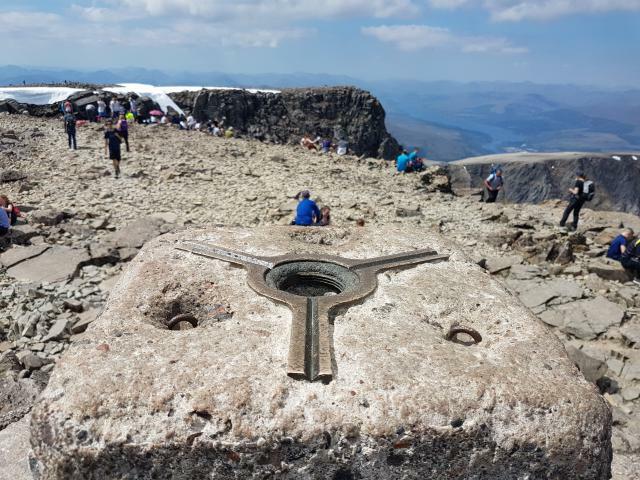 Walked up along the CMD arete, definately the best way to climb up,avoid the crowds and see Ben Nevis from a different perspective. Still a good covering of Snow on top. 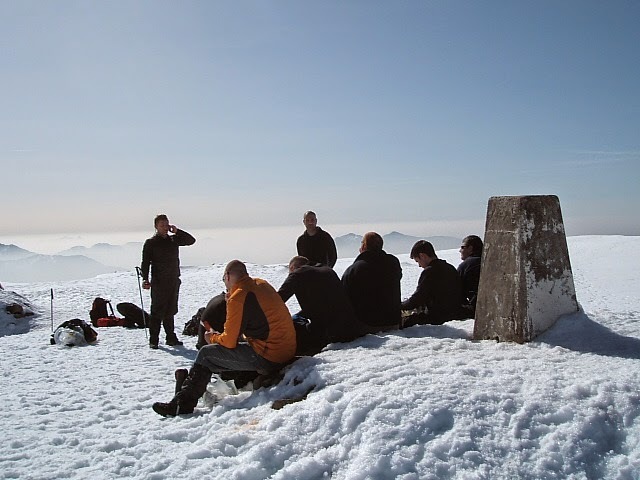 Another Ramsay Round recce - this time with axe and crampons. 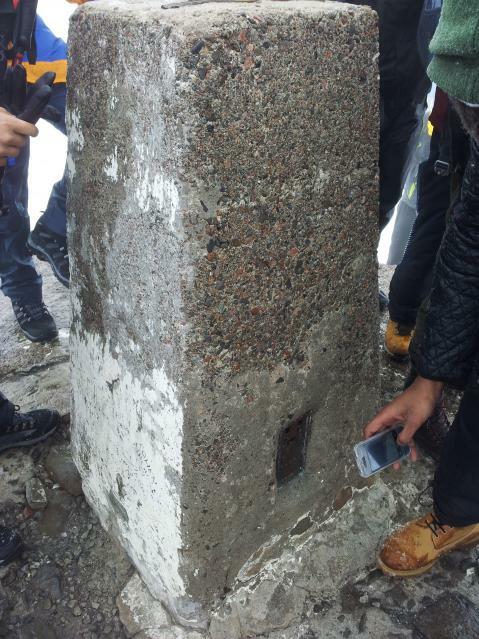 Pillar half buried in snow - amounts to about 2m snow cover. Tourist path busy with 3-peakers et al. 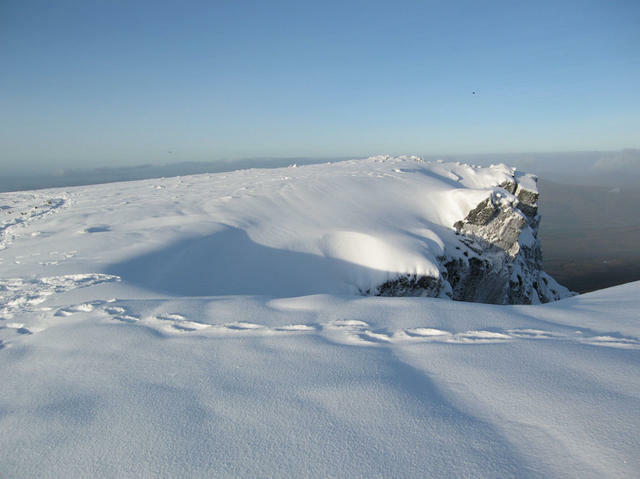 Had the CMD arete to myself though: no-one had crossed it since the last snowfall. Descent E off Carn Mor Dearg even more spectacular with knife-edge of snow and no choice but to shuffle along it, then 50deg snow slope to descend. 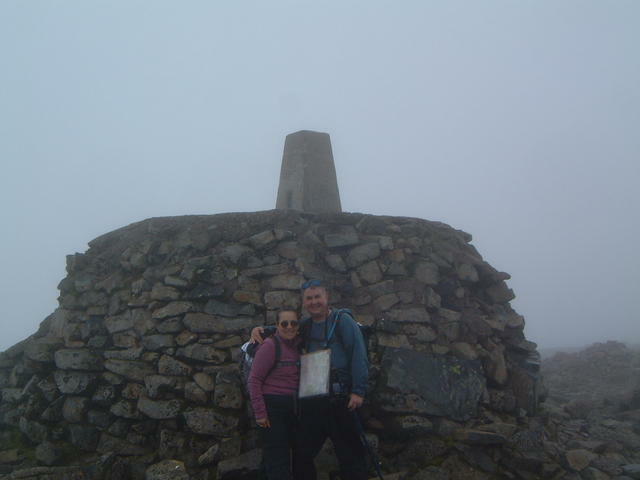 Thankfully down to the col, up over Aonach Beag and back along the Glen Nevis path. 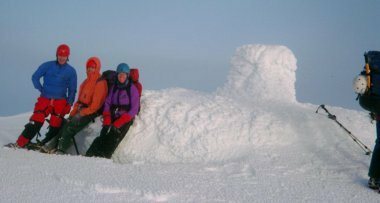 Hitched a lift back to the YH with a Fort William couple who confirmed a lot of snow had arrived since the start of April. Brilliant traverse - hence the score. 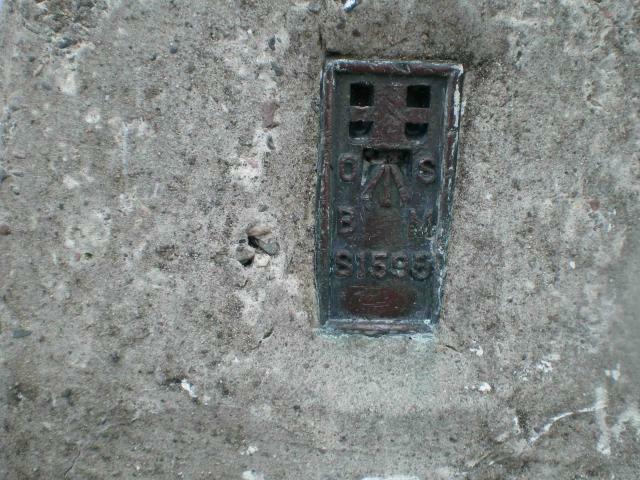 vgc, standard concrete Hotine pillar, with remains of asphalt-type plug. 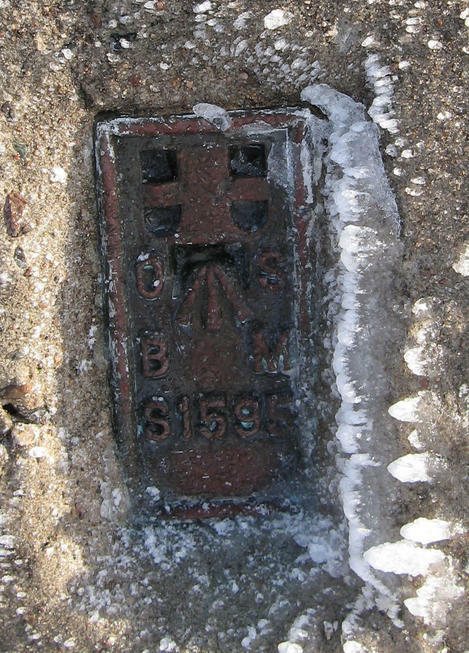 On stone platform of which c.1.5m was showing above the snow. Snow above c.1000m, frozen hard. Recceing for the Ramsay. 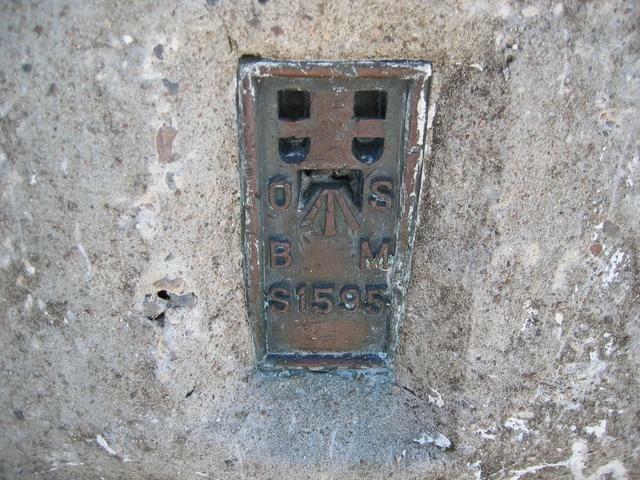 Up via Achintee path, no chance of descending to CMD arete today without hardware. Decent inversion, with summit and sky clear, surrounding hills all under cloud. A Snow bunting flew in soon after we arrived, apparently expecting food, but it was a bit cold for picnicking! 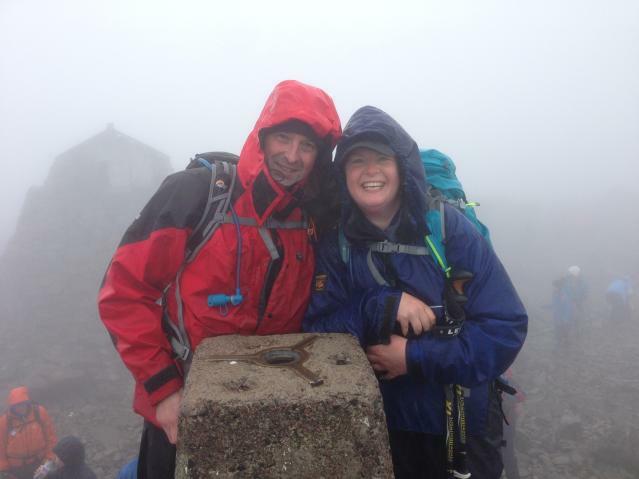 What a fantastic day, great walk but sadly the mist and fine drizzle was with us most of the day, so no views from the summit. The seven of us guys did lay claim to the storm shelter for our lunch, then wondered around the summit for a couple of hours in the hope that the cloud/mist would lift and grace us with some fine photographic views, but it was not to be so we bid a hasty retreat to the pub at start of the pony track for beers and more beers ;-) I would give this 10/10 but for the odd white paint that was on parts of it! Tis me in the mist ! Ascended via CMD Arete again. No wind but little visibility. Cracking day with some good glimpses of views on the way up Carn Mor Dearg. 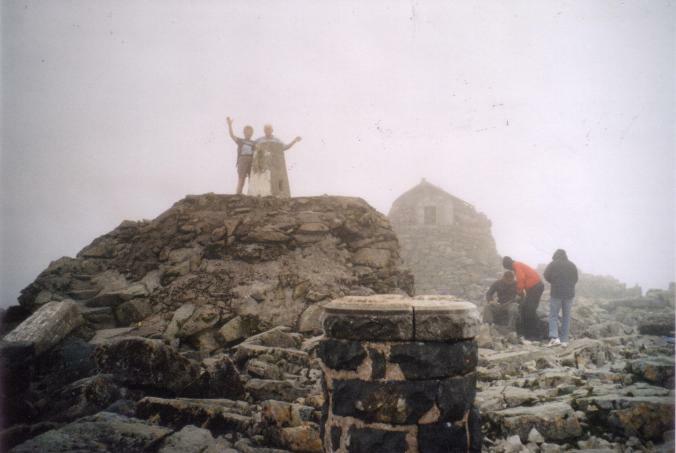 Weather was not as good as when I last visited in June 2005. 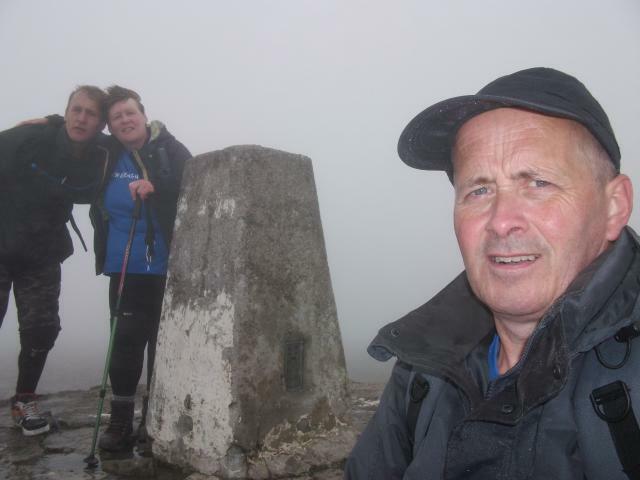 The views on our ascent were very good, but then the inimitible mist came in and hid all the nice views. A very good day and a great finish to our walking week. This was the third and last time I visited this point. On a good day the views are wonderful, however the stench of urine at the top was overpowering. Unless you are going there just to bag it I would avoid this peak like the plague. Top of the world! You can see forever from here. Stunning. 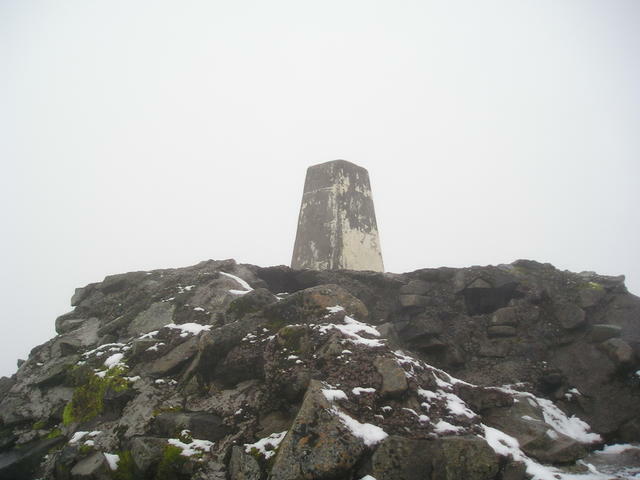 The Trigpoint Rare view without people. 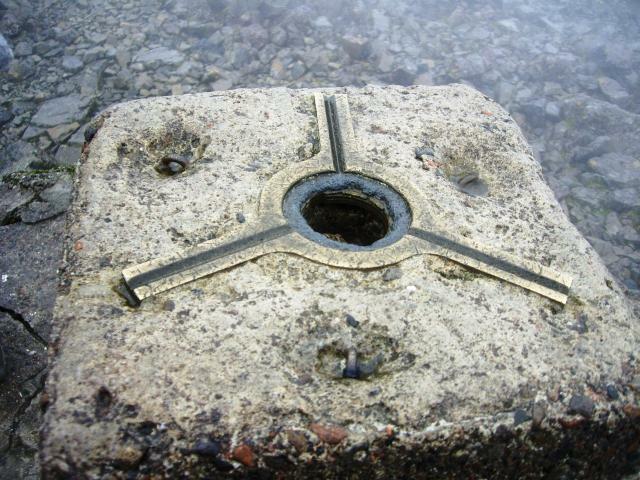 The flush bracket Well polished by thousands of fingers. 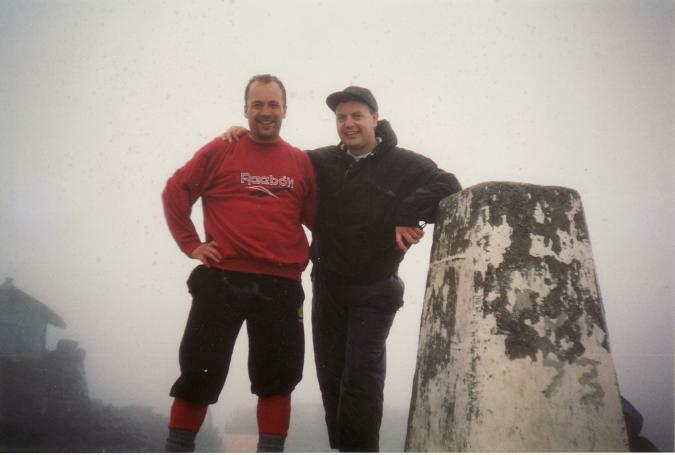 22/09/95 Me (on the left) with Steve Lyon, badly equipped, inappropriately dressed and wasted...Good Grief. 25/12/06 No one else there! 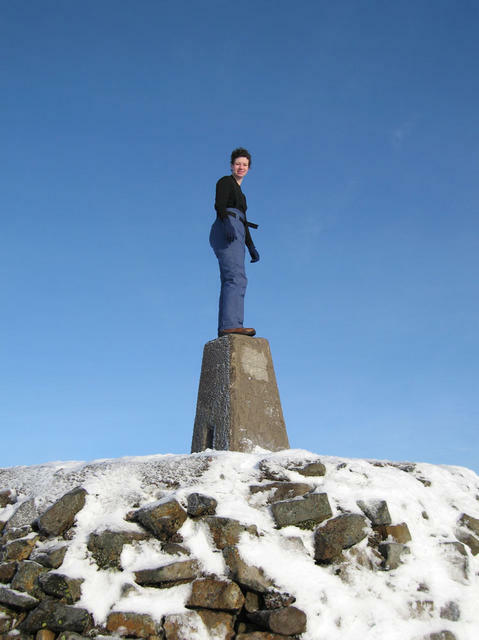 25/12/06 Guardian of the Trig Point! 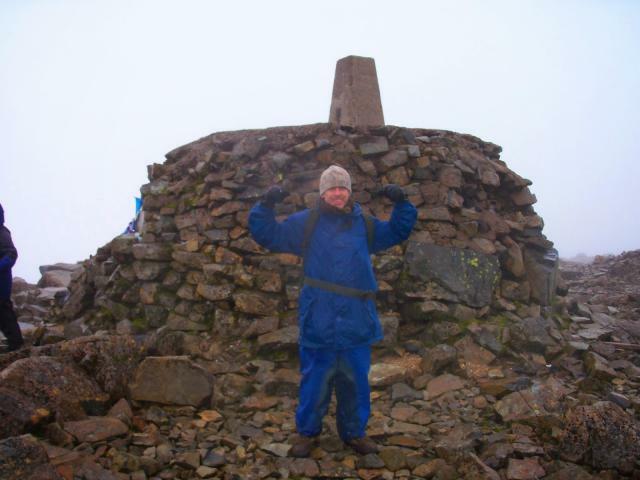 Well weathered but all there (except plug)stands on its own plinth.6am start in dark and rain third to reach summit,rewarded with a break in the weather passed 186 slogging up on the way down,a great day well worth the effort. I returned to get the photos (and better weather) that I lacked last year. Walked up tourist path and entered thick mist on the zig-zags but at least it wasn't rain. On the summit the cloud began to break and the views on descent were awesome. The Mamores were spectactular and I could also see the Cuillin in the distance. Not too many people on mountain either. 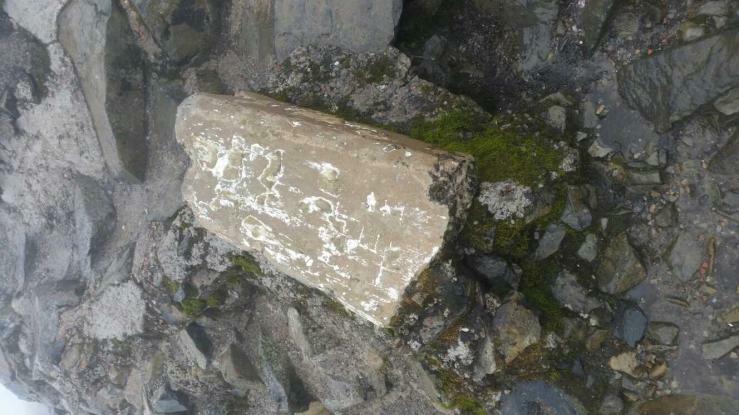 Trig pillar was busy though but is in good condition considering. Photos to follow. Daniel and I slogged up from the visitor centre in 3 hours 10 minutes in fair weather. 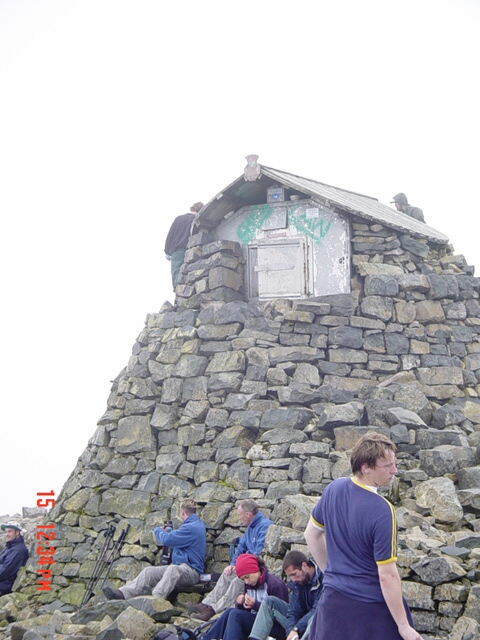 Quite busy at the top, with many wanting their pictures taken at the pillar, so its good condition was a surprise. 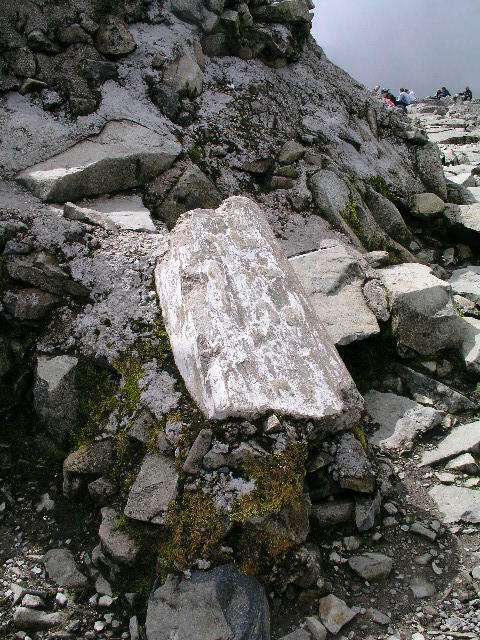 An earlier pillar is partly concreted into the summit cairn, at the base of the steps. Dan and Brian on top! 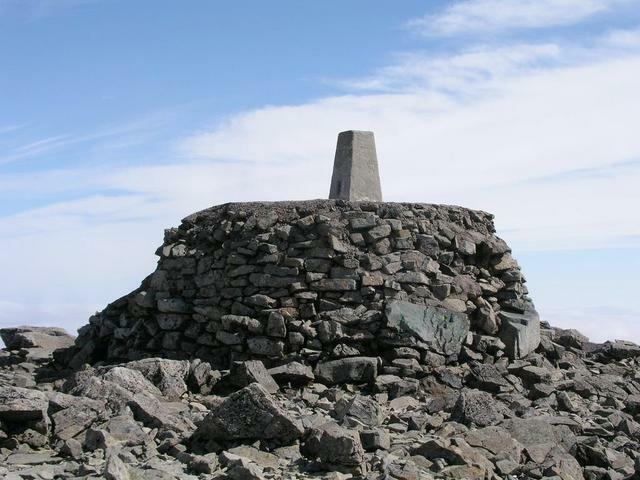 Highest ground on British Isles, OK we already know that! Summit very busy with visitors from all over. 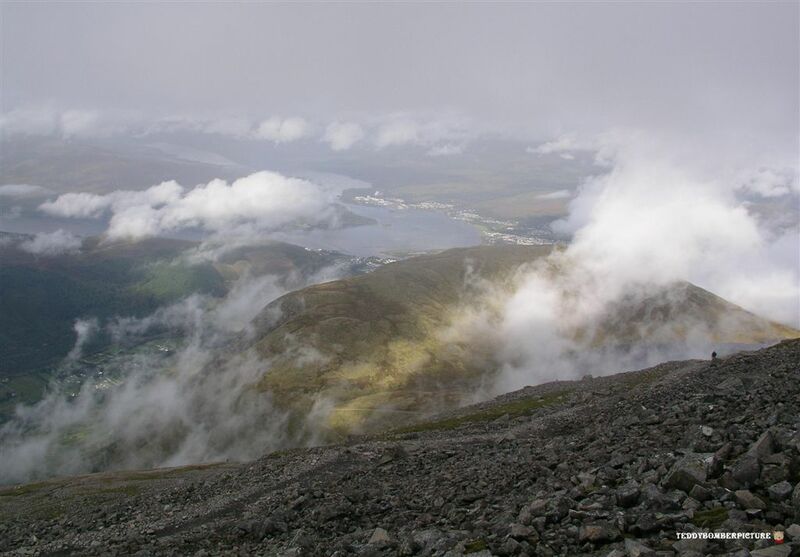 Weather at summit dismal as reflected in photos. Will try again for better weather possibly next year. My only real complaint is about all the litter and crap (in both meanings of the word) left at the summit by so called humans. 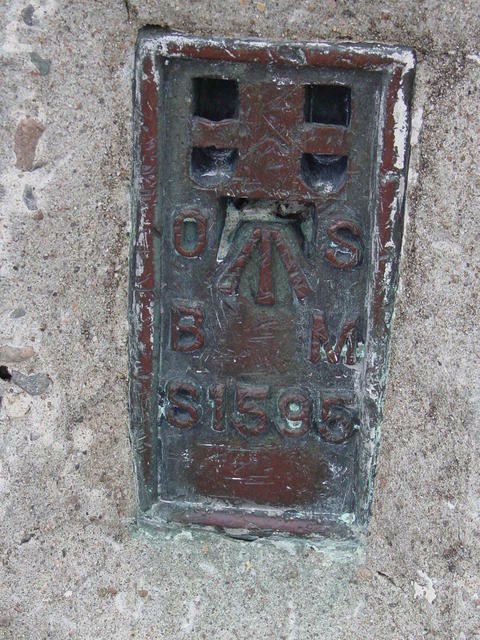 Highest trig pillar of all OSGB trig pillars. 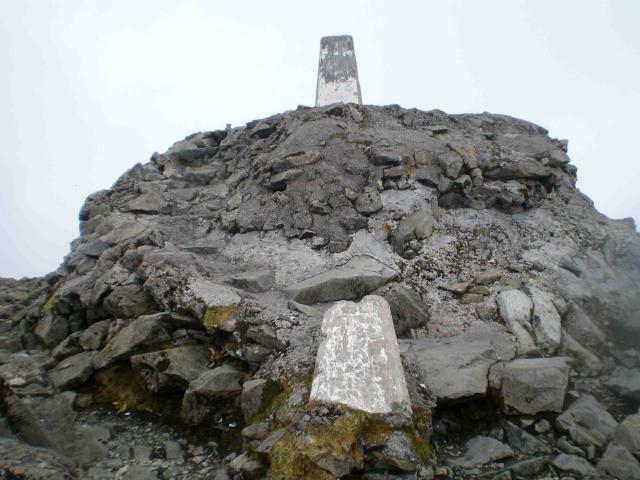 The trig pillar (which had rubbish removed from its top it by another visitor while we were there) is in good condition considering its altitude, exposure and general wear and tear from visitors. The polished spider is open and filled with debris and water. Back sighting hole open, others plugged. FB faces WNW. 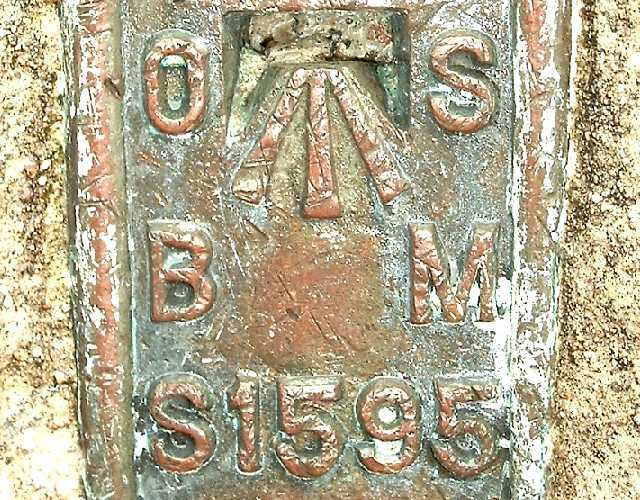 Primary station PP323 on OSGB retriangulation network. 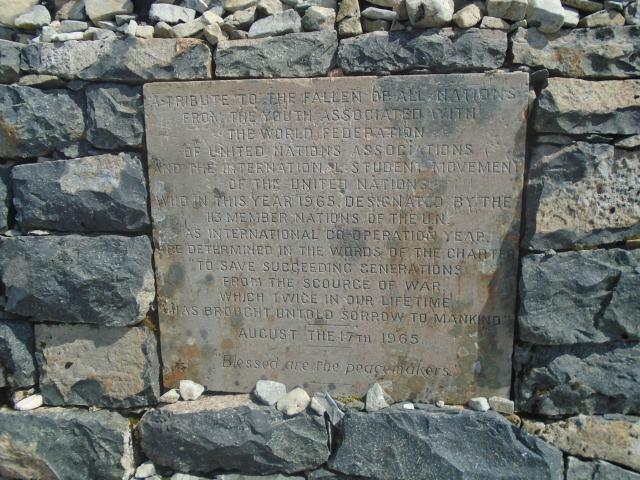 Pillar completed 6th August 1936, total cost �30.12s.3d. Photographed 12/08/2006, GRP & ACG. Long hard slog to the top, but made it. No views for me, cloud all the way from about 2000ft. Worth it though, just to say I DID IT. 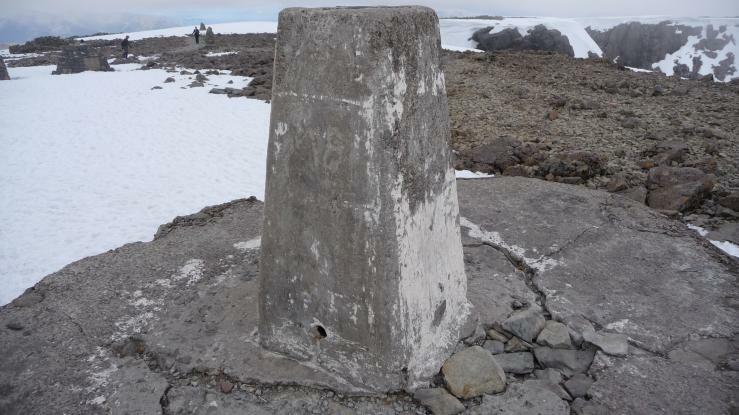 "Strolled" up here on a clear, too-hot, day to bag the highest height in UK as well as this trig and a letterbox = all my hobbies rolled into one! Not a walk to be lightly undertaken however, but so pleased that I have achieved it. 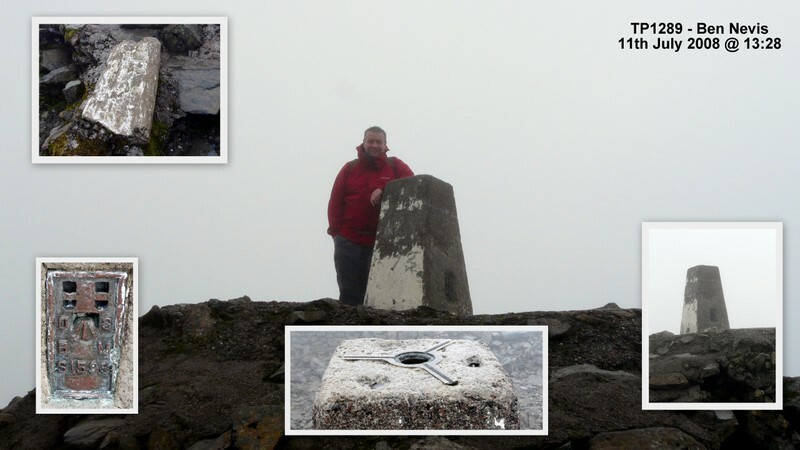 Logging this much later in October 2014 as now loging trigpoint visits. 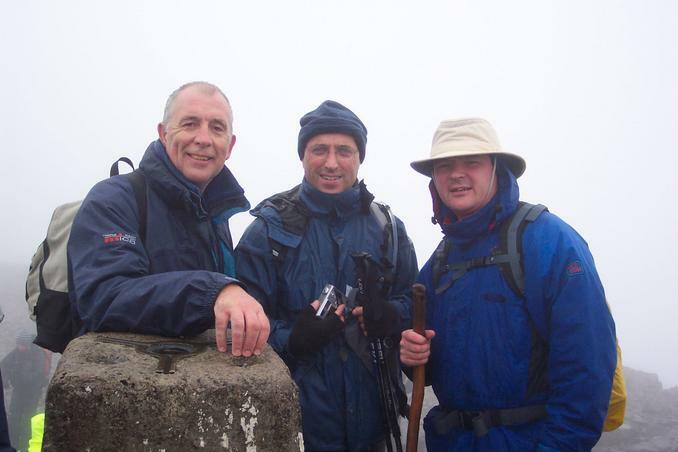 Climbed Nevis to add some support to George, Derek and Stuart who were doing the three peak challenge for the hospice. 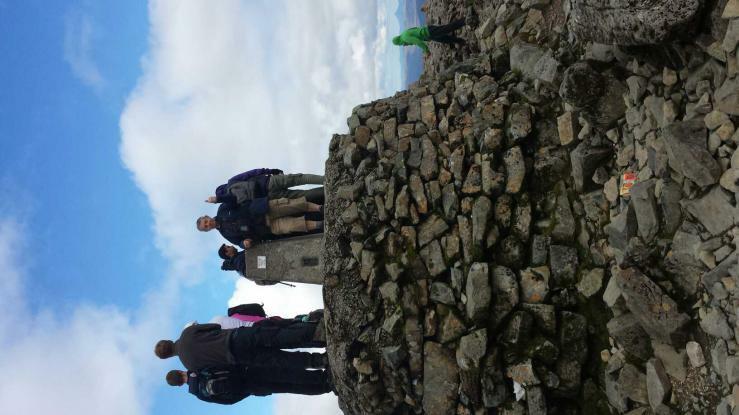 They managed it under the 24 hours and raised over �2000. Well done boys. 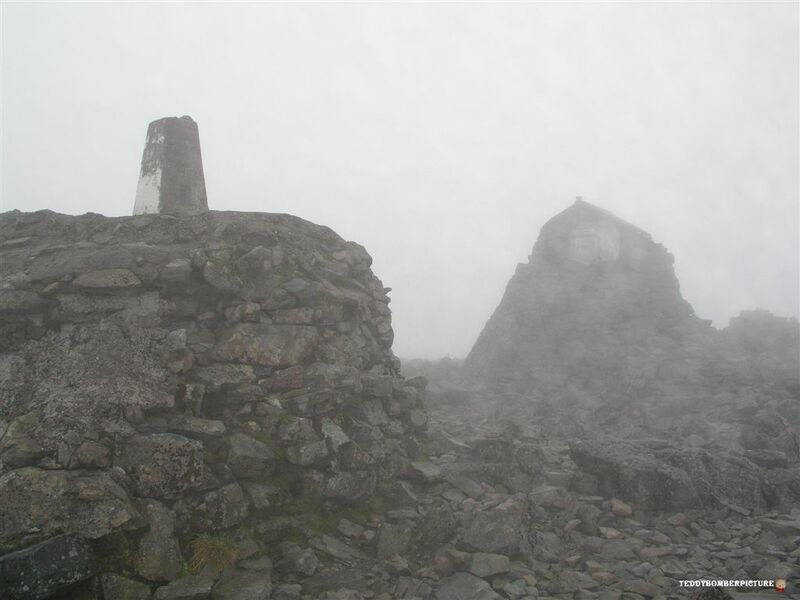 Ben Nevis on a wet and misty day. 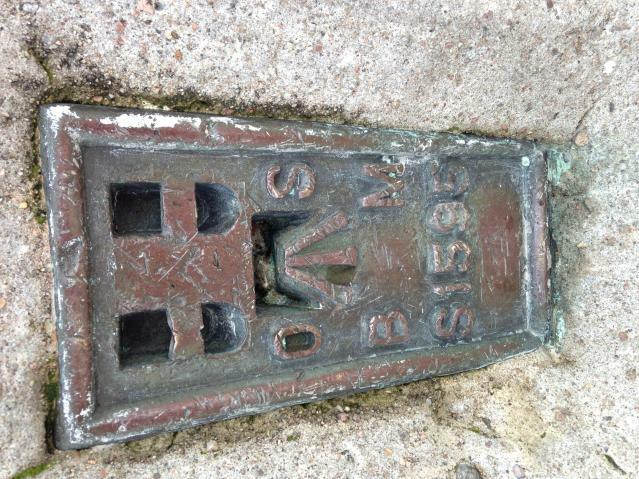 United Kingdom, Scotland and Inverness-shire top. 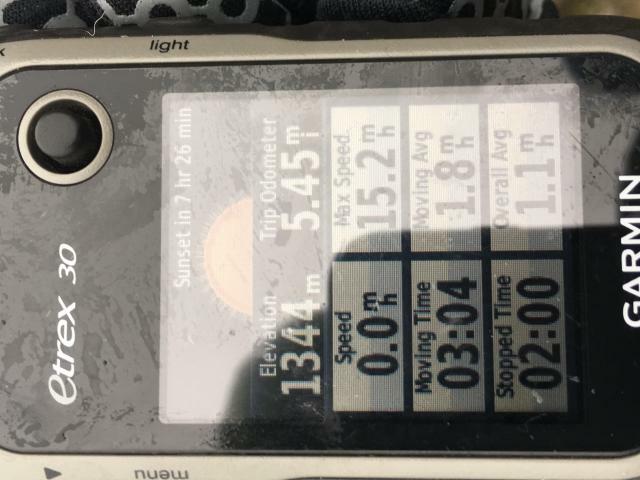 An hour after the previous log! I can only agree that the views were spectacular, lucky to have such a clear day. Great views a good covering of snow on the summit. Covered in snow, although not as much as usual for this time of year! 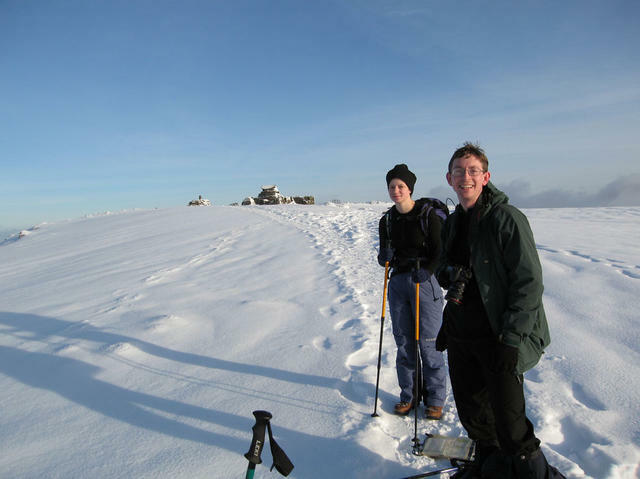 Great weather, though we regretted not bringing our crampons at some points along the path. Stopped for a bit of lunch, then headed back down for the long walk back to the car. 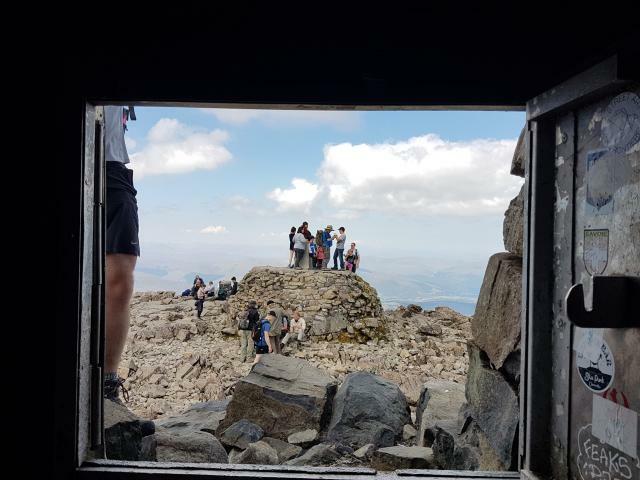 We were very lucky to get great views from this one after sitting it out in the summit shelter hut waiting for the mist to clear - it suddenly did after only 10 minutes! Amazing views of the northern cliffs and gullies from the trig pillar which is on a kind of stone built platform. Great views today as far as Knoydart and the Skye Cuillin not to mention the views of The Mamores. A special place. Ascended via the Carn Mor Dearg arete. NEVER AGAIN!!! 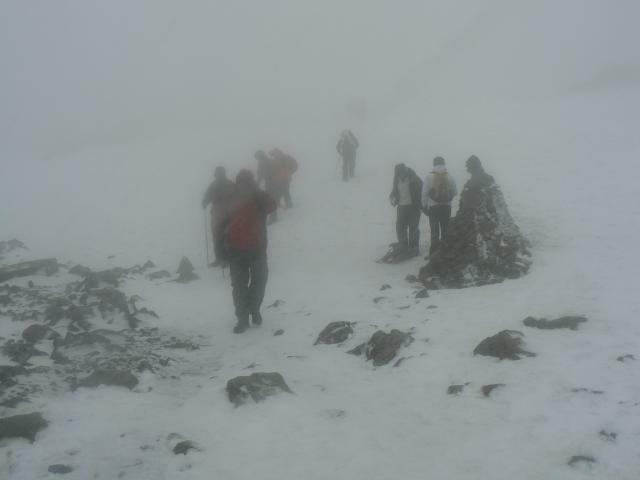 This was the our final climb of the 3 Peaks Challenge "Snowdon", "Scafell Pike" and "Ben Nevis" It nearly bloody killed me! 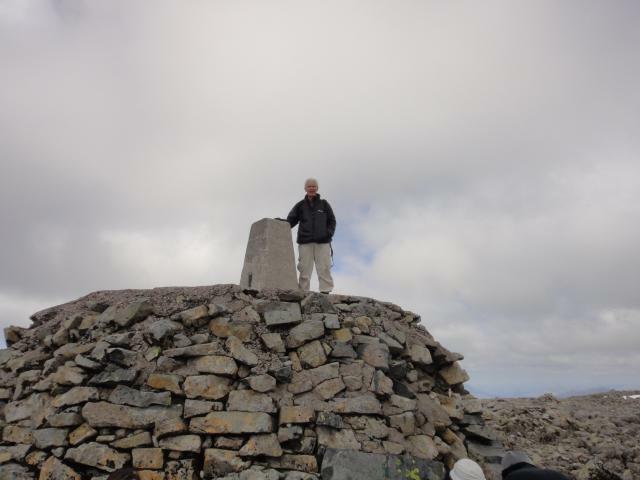 Started at Ben Nevis Inn and ascended Carn Mor Dearg before crossing the CMD Arete and onto Ben Nevis. 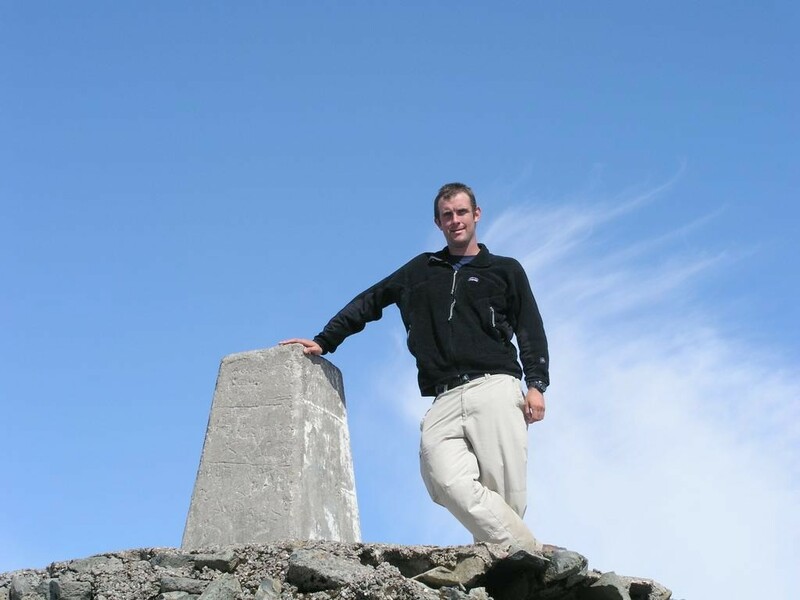 The ascent from the arete to the summit of Nevis was the hardest, most morale sapping climb I've ever done. 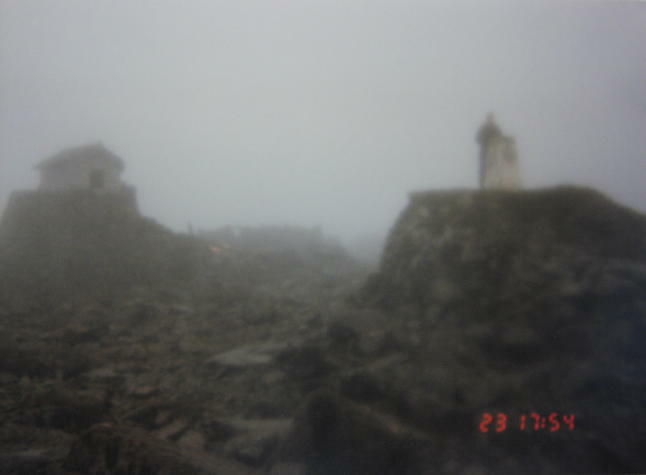 The weather was very poor with rain and gusty wind thus no view at the top. I will return next year in the hope to get a view. The crossing of the Arete was the best part of the day. 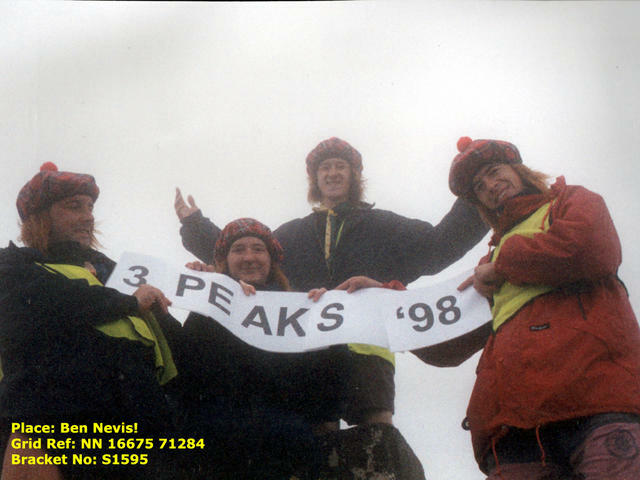 First on our collection for the Three Peaks Challenge which we eventually completed in the nick of time. Lucky to have an almost totally clear evening and the views on all sides were out of this world. 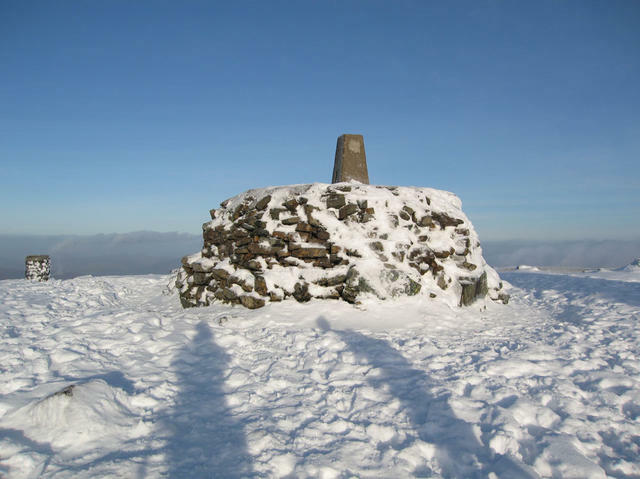 Being the highest in Great Britain is an amazing feeling. 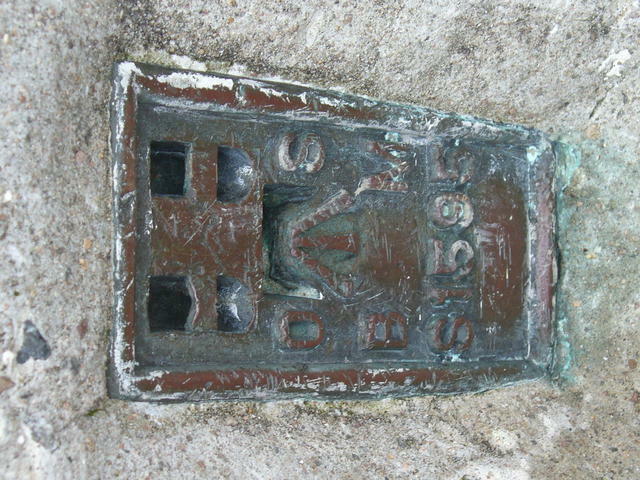 Trig point is near the old observatory and war memorial on a raised platform. It's in good condition considering the frequency of visitations it must endure. 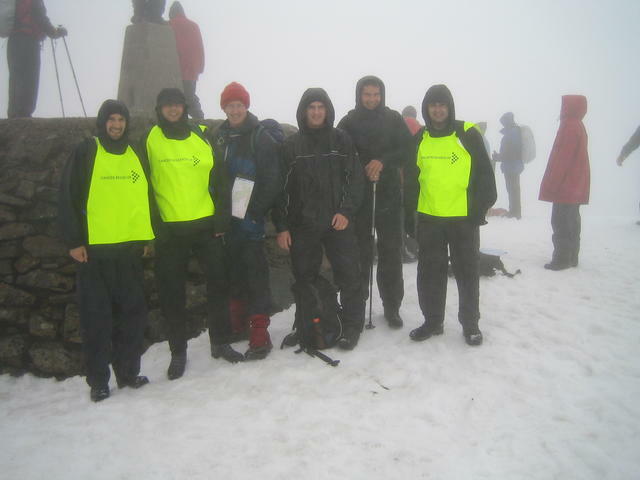 Start of the 3 Peaks, weather was terrible, pretty much the pattern for the rest of the challenge! 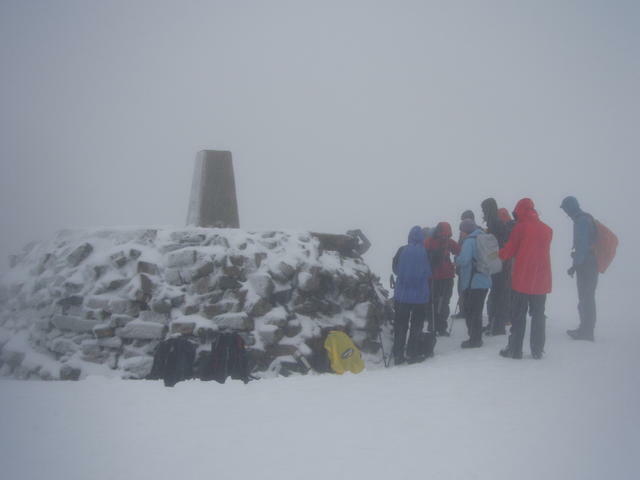 Busy on the summit due to Shelter also doing the challenge. Long ascent but mega extensive views. Snow buntings on summit. 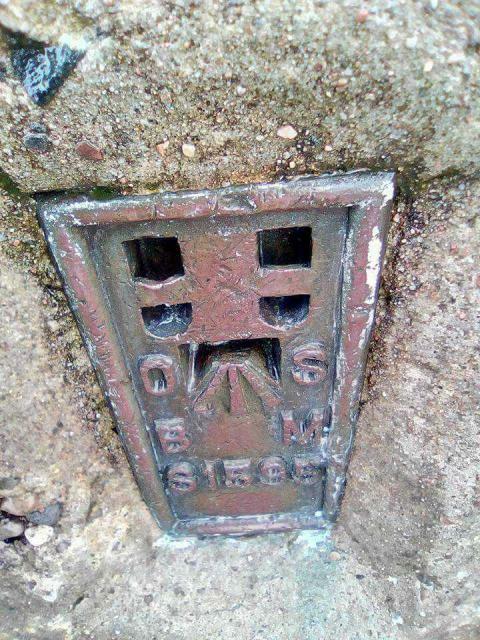 Found whilst geocaching. Lovely clear day but plenty of snow over 2000ft! 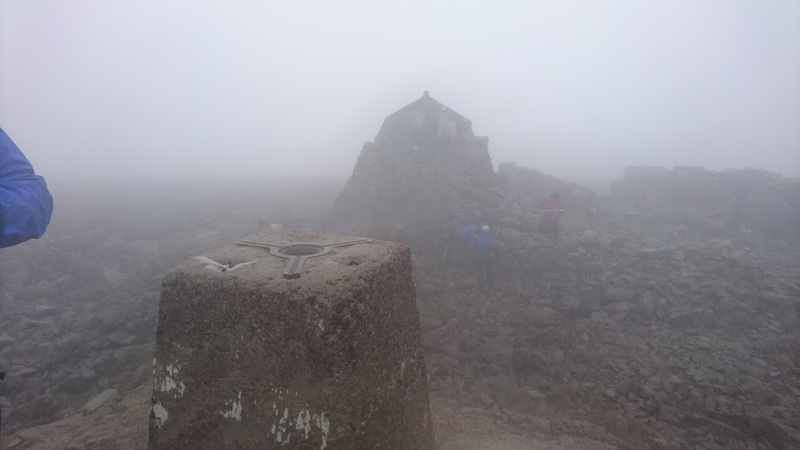 Was a race against the light to get to the summit and back, fair bit of mist on top which slightly cleared to give good views to the South and East. Legs aching for days after, but worth it. In Corpach for a weeks holiday with friends. Too misty to see anything!! 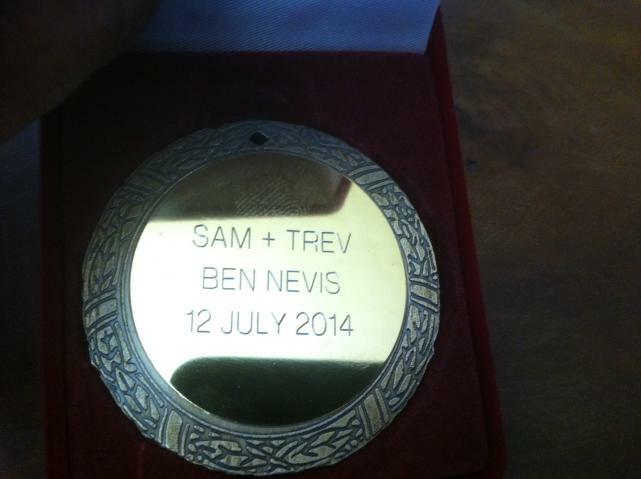 Bagged this along with a Munro and Britain's highest cache on the 1st Scottish Geocachers Day Out. 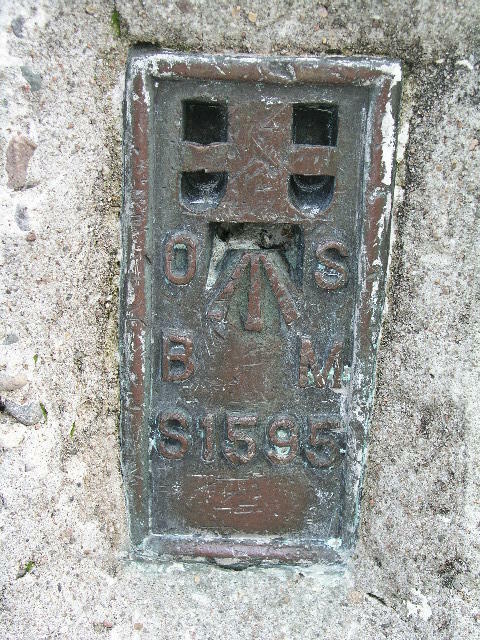 Came up for the 1st Scottish Geocachers Day Out. 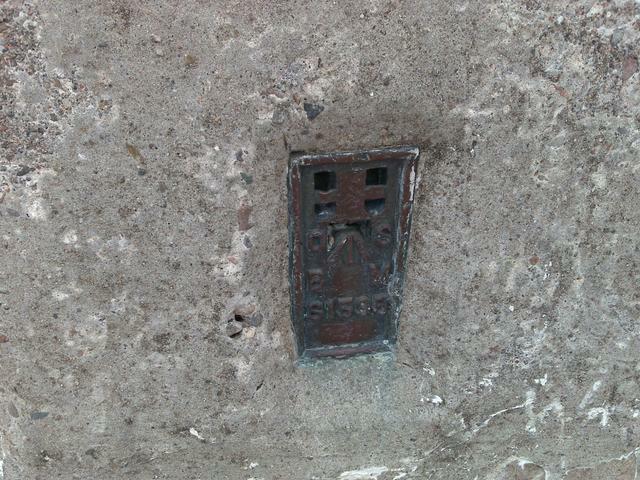 Although the concrete is sound enough, the metalwork has suffered a bit from 'visitors'. 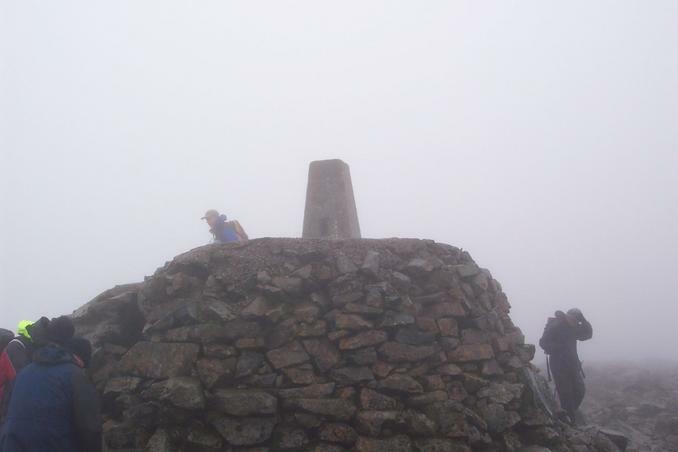 The view, all 20 yards of it, was grey and misty but would have been stunning on one of the three clear days a year. 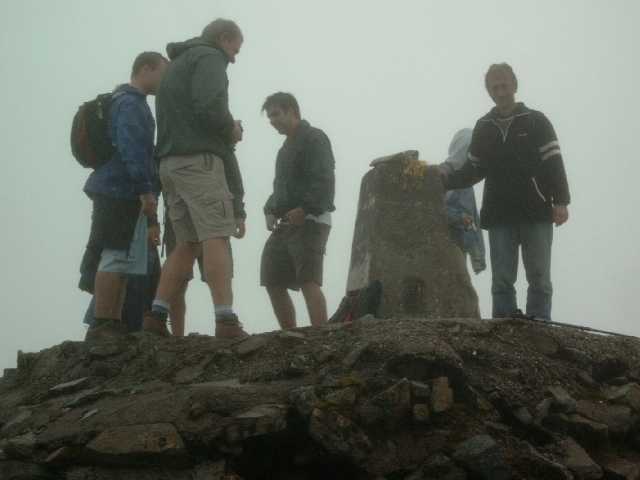 Done this during the 1st Scottish Geocacher's Day's Out Event, which was arranged for a group of cachers to go up Ben Nevis to log the geocache which is there. 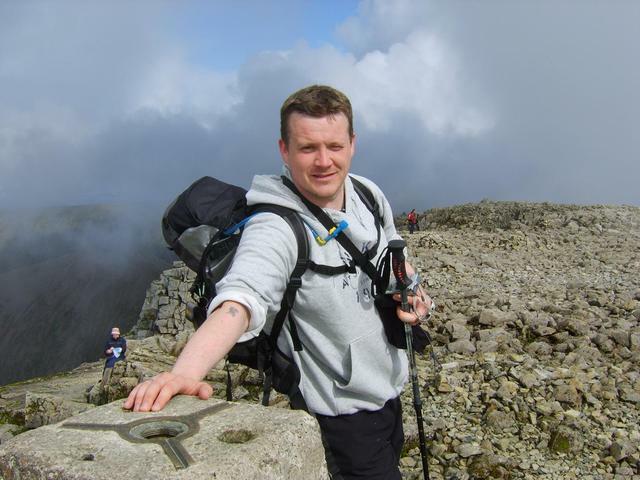 My first ascent of Ben Nevis! many visits up here,-still not done the traditional belay round it though! A hell of a hike! The Ben. Cool. 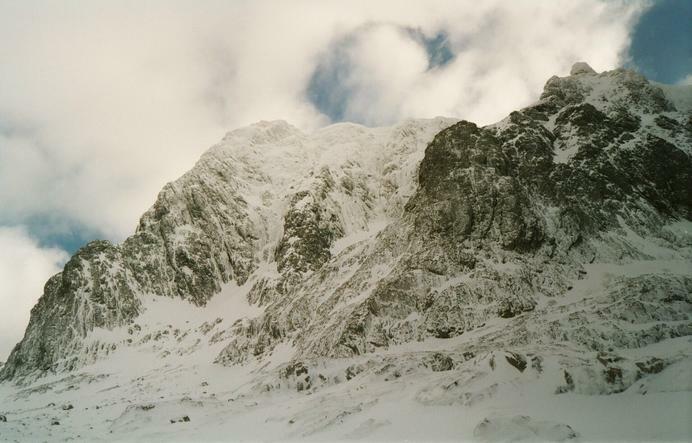 Ninth visit, came up Raeburns Arete and NE Buttress. 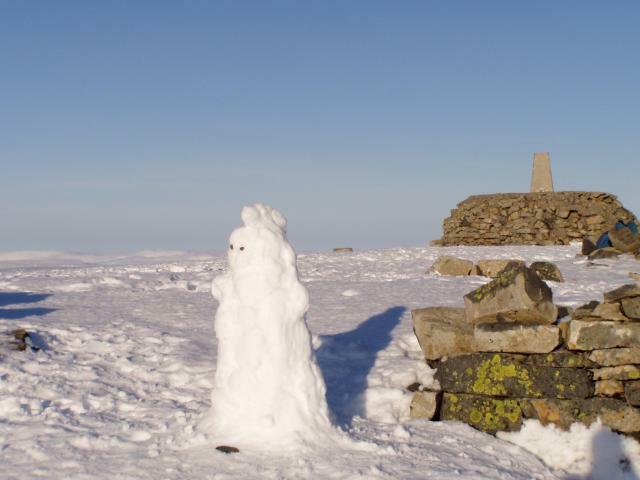 finally got to Great Britain's summit up the safe but boring tourist track--sunny and clear until cloud ceiling 200 m off the top but presence of snow buntings made up for the loss of view. very high what more can you say. 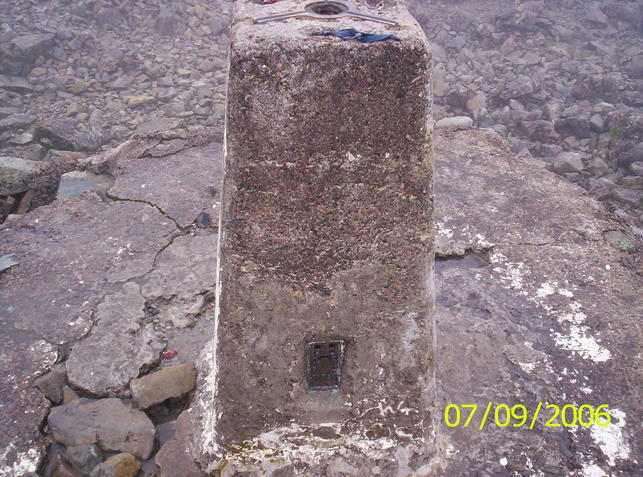 Its the highest trig point around. Glad I did not have to carry the cement up !!! 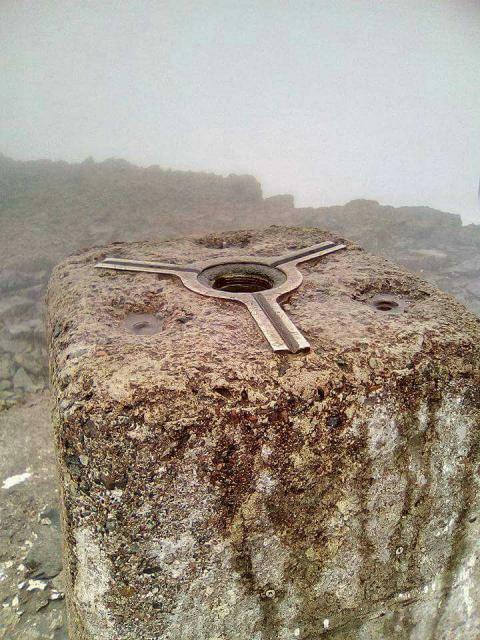 Reaching this trig point gives you a high, both literally and physically. 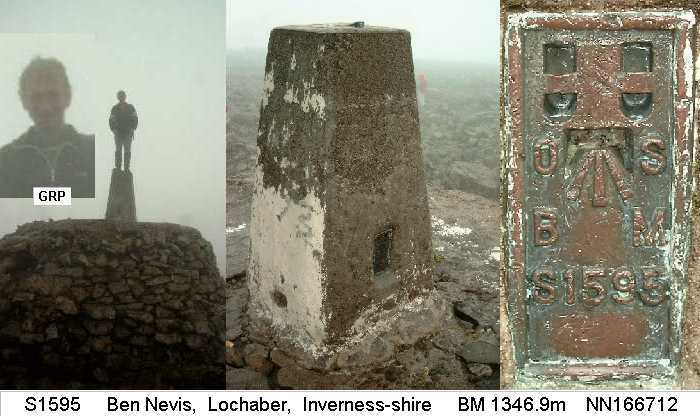 I had been up the Ben before, but this time it was the last of the three highest points in each country that I was walking up on my walk around the coastline. A nice day, and there was even a 70+ gentleman at the top! 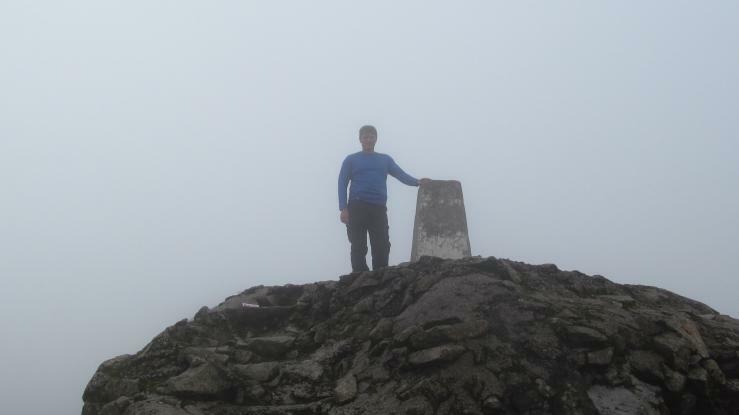 My first Munro, lucky to have chosen a great day for it. 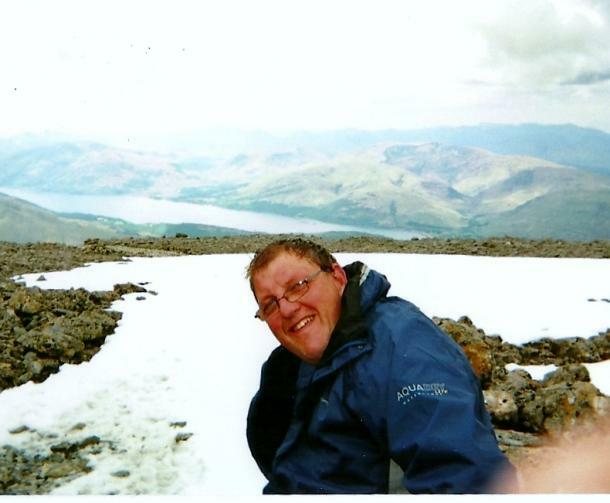 Fantastic views from the highest point in the UK. Not much to be seen from up here today; did it after finishing a walk from Crieff yesterday. 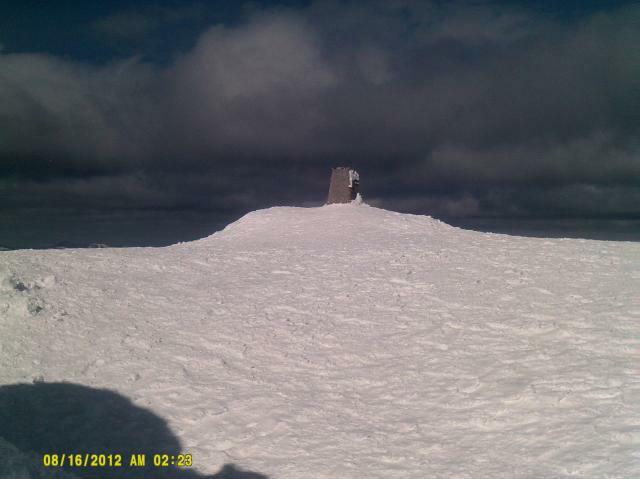 Not the best summit plateau in the world, although the weather observatory is always interesting. 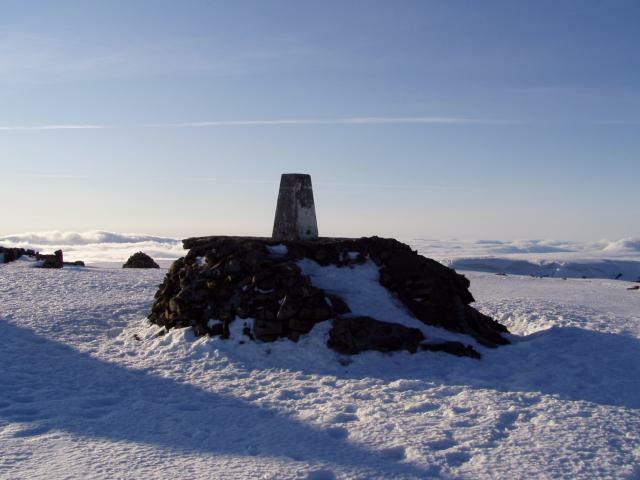 We picked the perfect day to climb our first munro - clear skies in all directions - fabulous views! No details noted - no comment necessary! 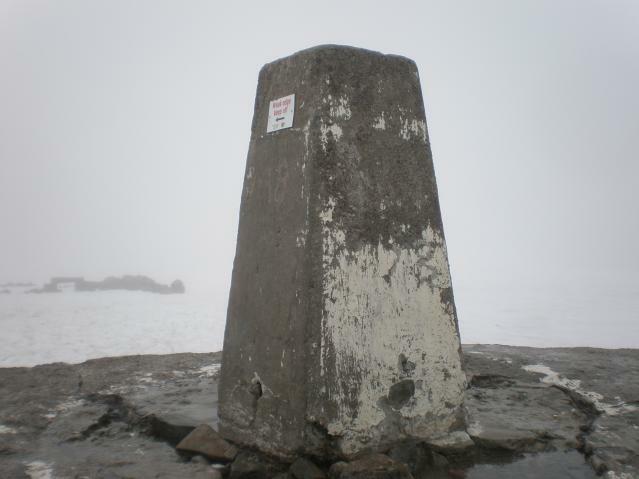 Walked up here for my 42nd birthday to start the 3 Peaks which we didn't do all in one go but over the space of a week. Very foggy on top and snow (in July!!!). Traditional finale to completing the WHW. Warm and bright, thin but fairly solid snow on top few hundred metres. People everywhere, in a fantastic array of under/over-dressedness. Not sure about the condition.. Buried under snow and rhime. A good day on Ledge Route. The big one, a good birthday bag. 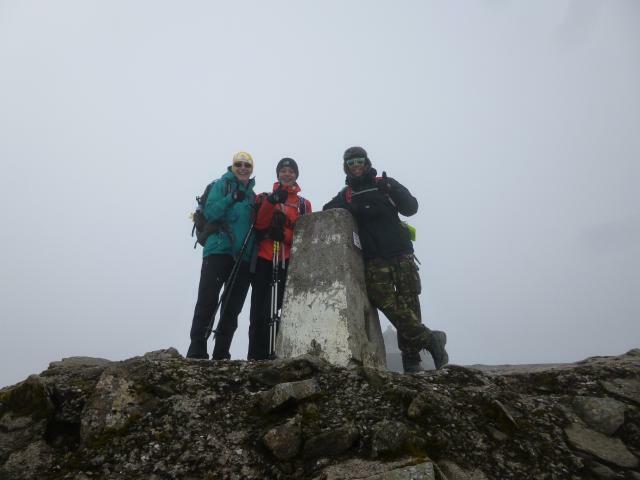 Ascended via the Carn More Dearg arete, the summit was popular and misty. 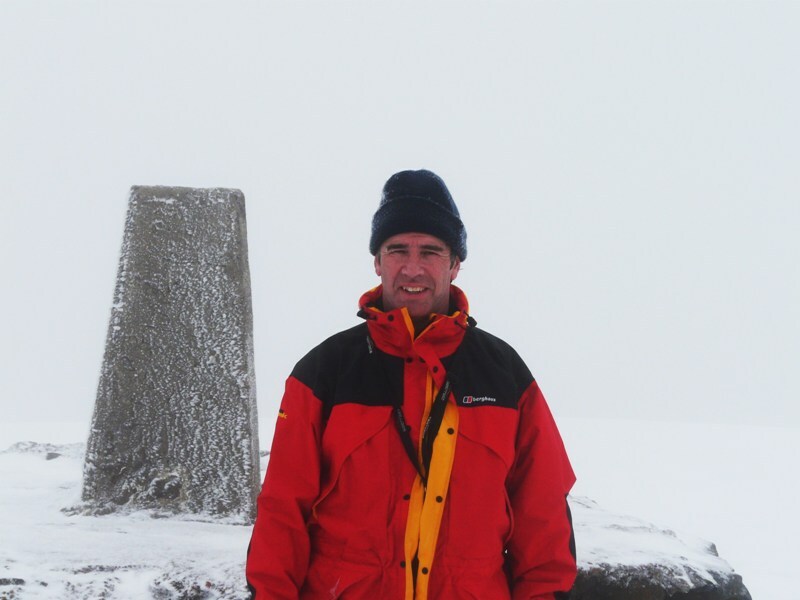 First ascent of the Ben via Carn Mor Dearg and the arete. Although I was aware that the summit would be full of a variety of people, it was still an eye-opener . The day was beautiful. 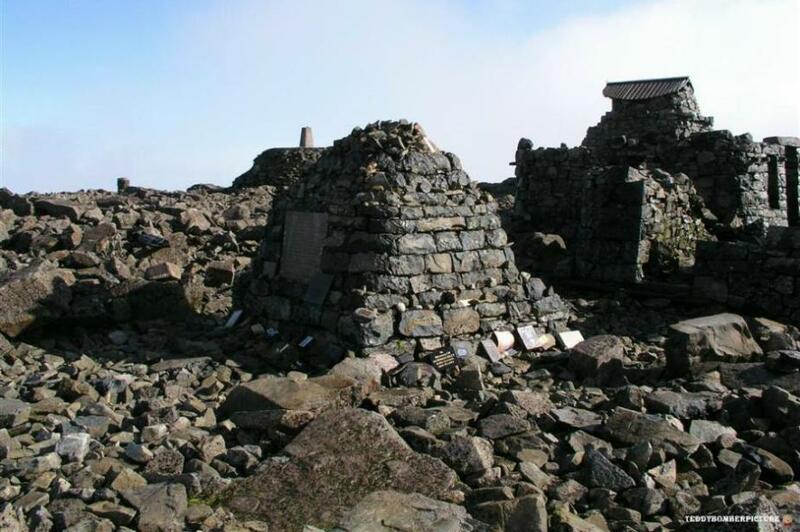 2 further ascents , one more by the arete and one when I was doing a litter pick with the John Muir Trust. First after the summit snow had melted and revealed everything ( and I mean everything) that had been dumped ( again I mean that in all senses) ver the winter. 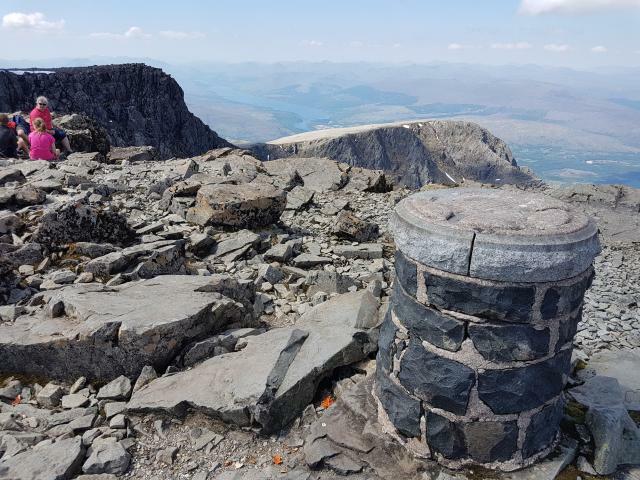 Visited as part of a 3 peaks challenge. 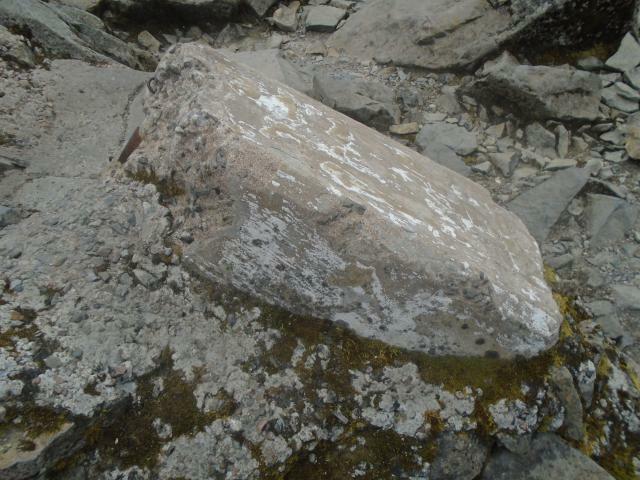 There is also a second toppled Trig pillar near to the base of the current Trig. 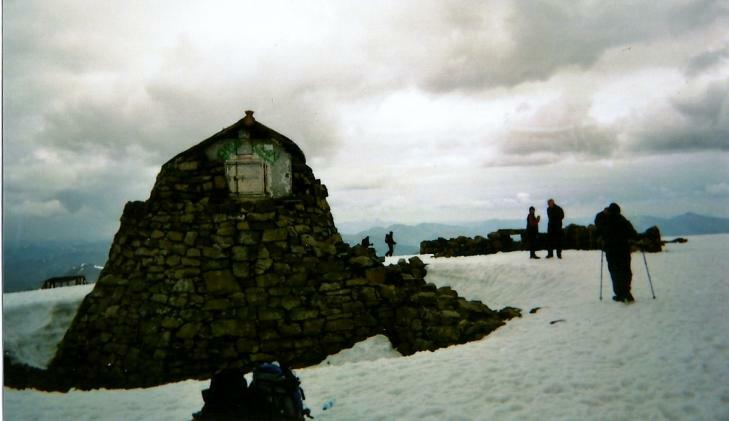 We climbed Ben Nevis on a beautiful June day that saw people sunbathing on its summit. Excellent visibility, could see the Cuillins on Skye. 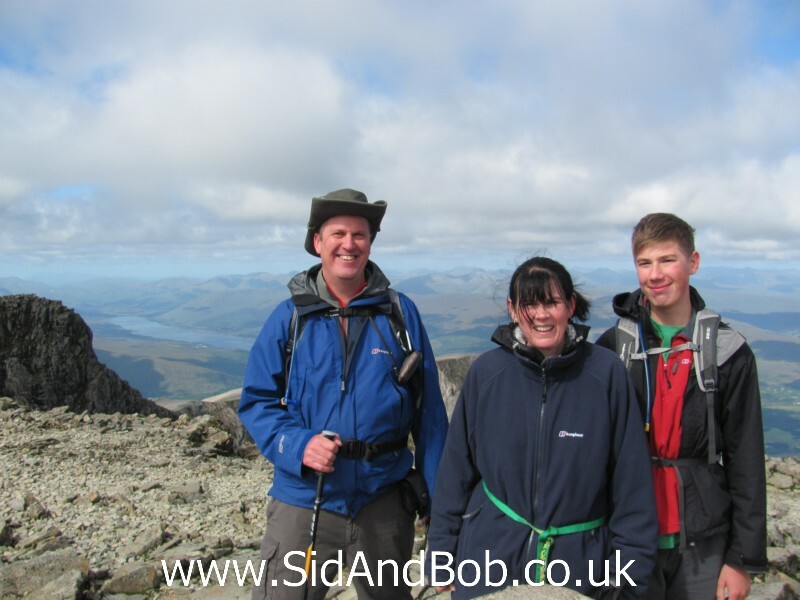 This was the aim of our Scotttish Holiday - to climb britains highest mountain. Took all day but was well worth it! 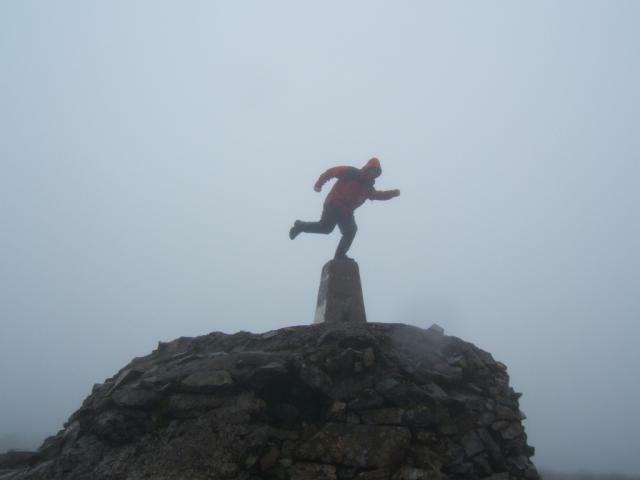 Celebrating last Munro! 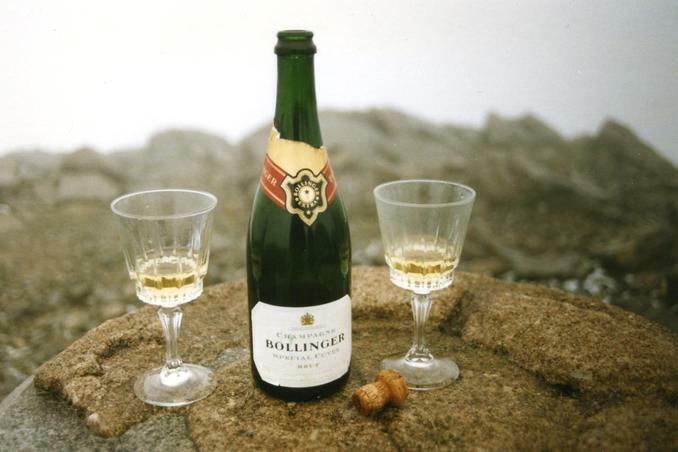 - which in fact was Carn Mor Dearg done an hour earlier, but we drank the bubbly on The Ben. 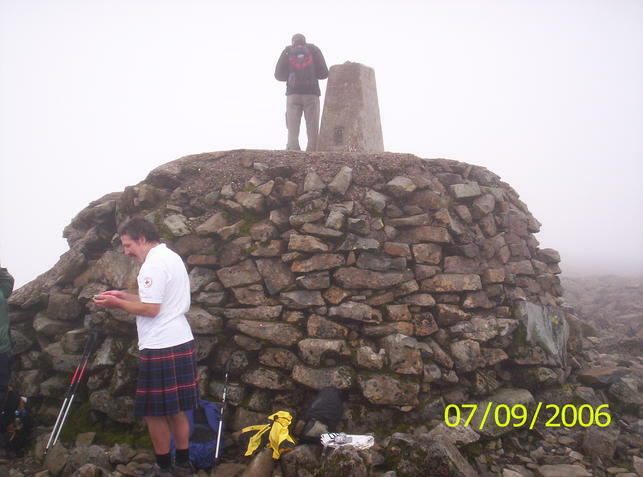 Last Munro 'Top' also done same day, Carn Dearg Meadhonach. 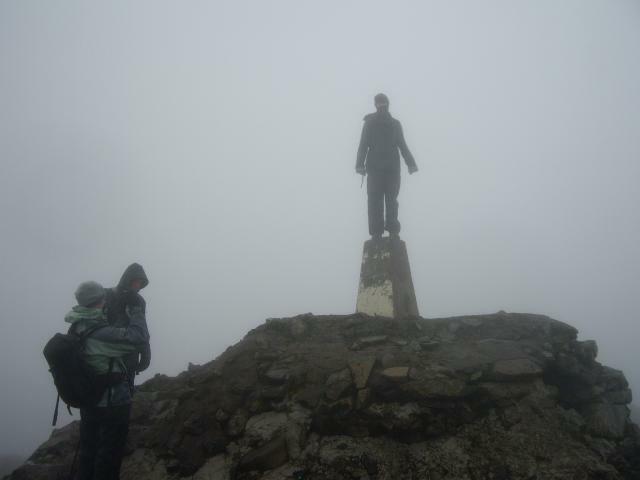 My third time up The Ben. 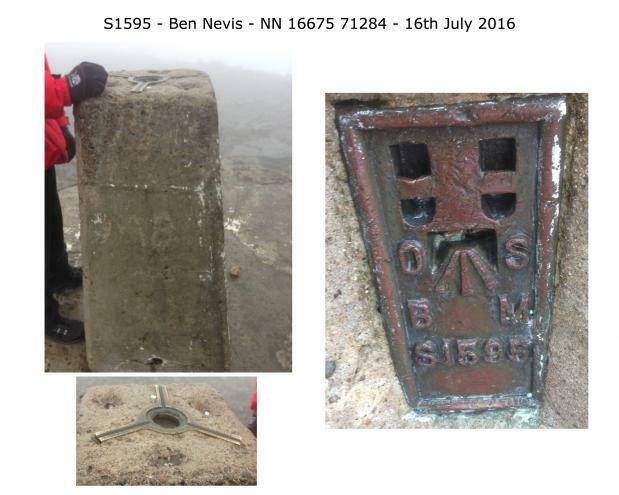 Ben Nevis The indicator plinth, minus indicator, and son Mike. 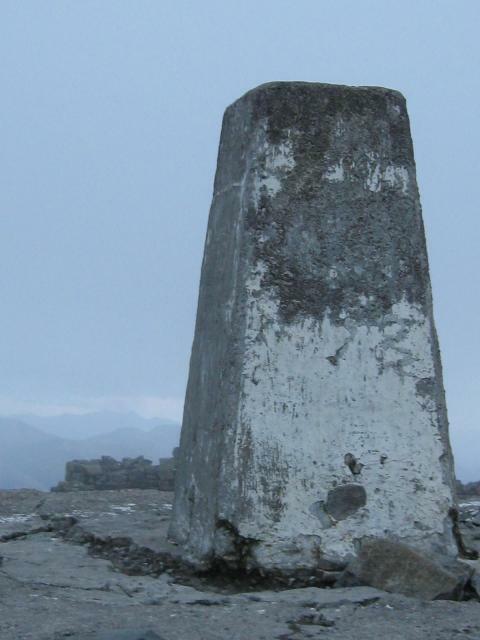 Carn Mor Dearg Last Munro. My third visit even though this is far from my favourite hill. 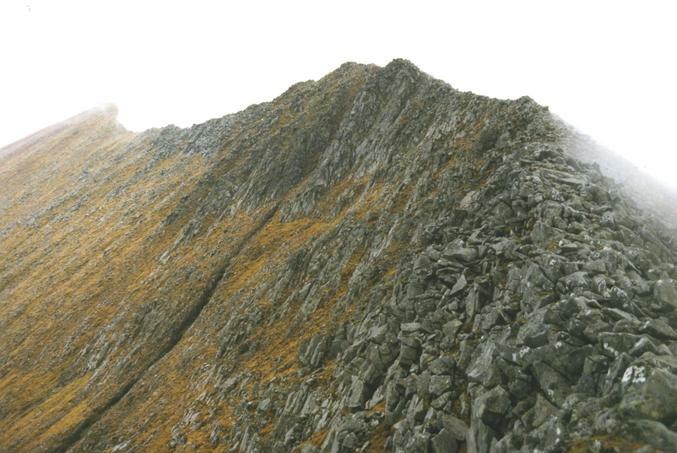 But the approach along the Carn Mor Dearg arete is very fine. 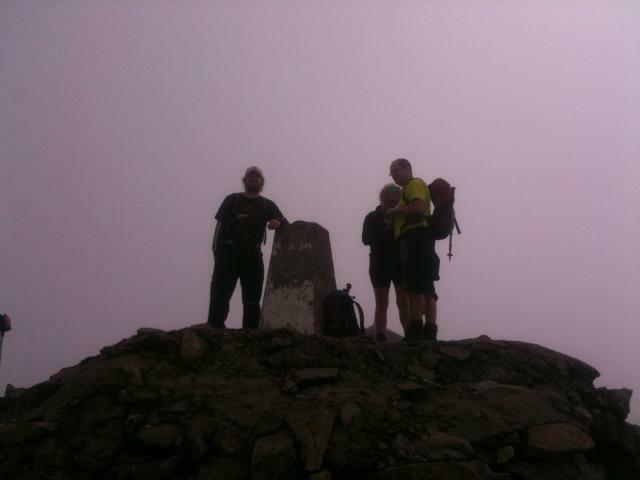 With Joe and Ann great visibility via CMD. This is one that I went to many years old. There was snow at the top and the one thing I remember the most was seeing an Oriental chap walking up wearing flip flops and carrying a Tesco bag. I don't know if he made it to the top as there was snow on the ground even in June. I logged it based on the fact that I have been there (and have a to photo to prove it) but am not likely to go back as I have other walks that I would like to do. First ascent with my nephew (Jock Handling). 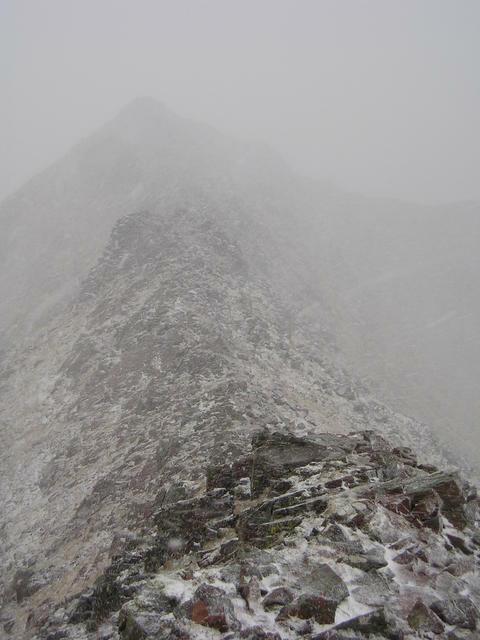 Bad weather at the top with wet ice (seems to be the way of things). A cloudy day with poor visibility, but at least it was dry. 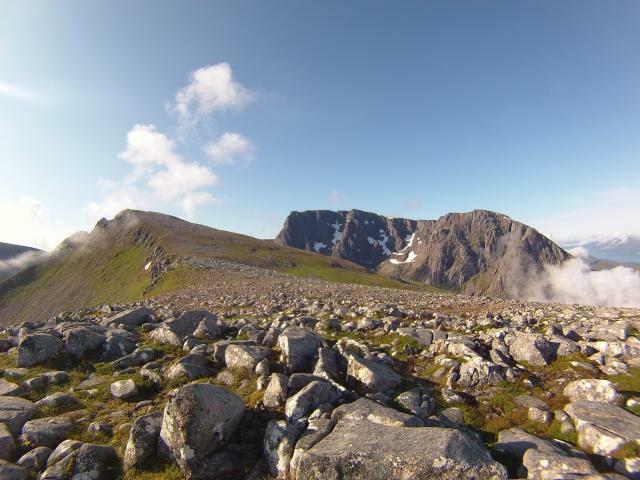 Glen Nevis Campsite - tourist track to the lochan - CIC hut - Carn Mor Dearg - CMD Arete - Ben Nevis - descent by tourist track. 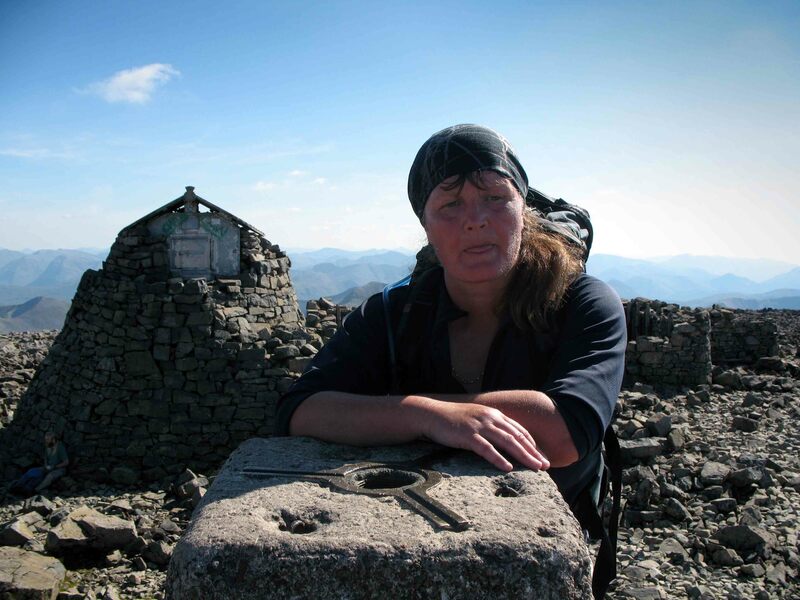 A long day and a very tough climb from the CIC hut to the ridge. 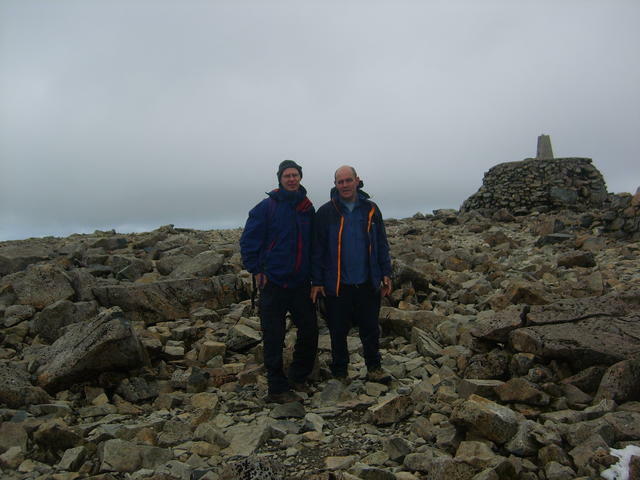 Excellent going along the arete and the final climb. Cloud above 4000ft so no view from the top. 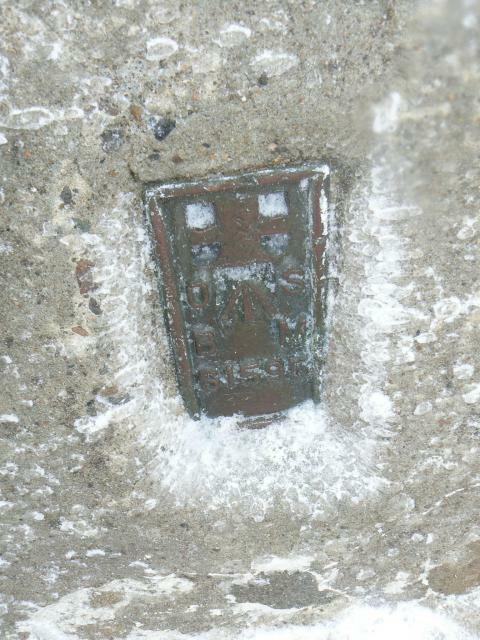 Again flush bracket deep under snow. Annual scotland trip with Kevin & Andy. 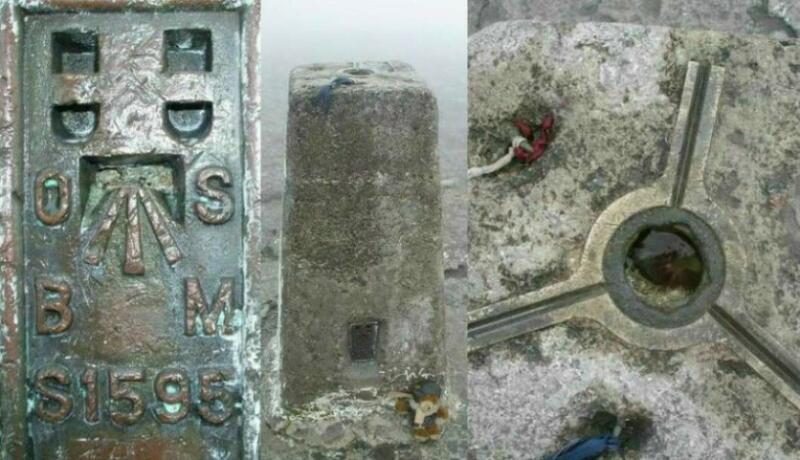 Did this on honeymoon, long before aware of trigging but must have seen trig point, surely! Remember Snow bunting at summit! Have visited this summit 3 times. 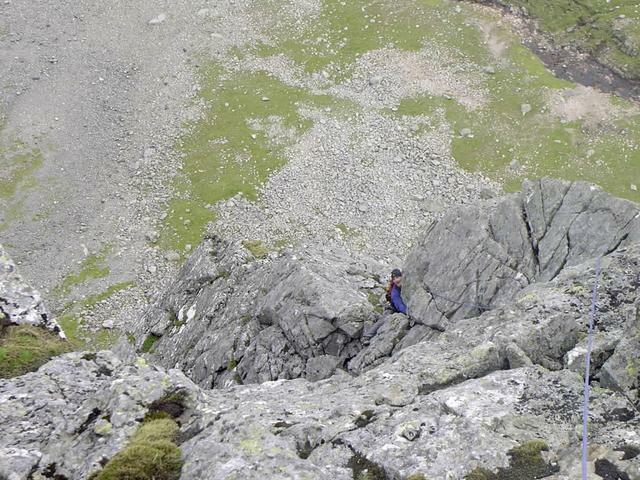 First ascent by Tourist path, 2nd by Carn Mor Dearg arete and 3rd by one of the gullies. All great routes. Superb views from top (on two of the visits). 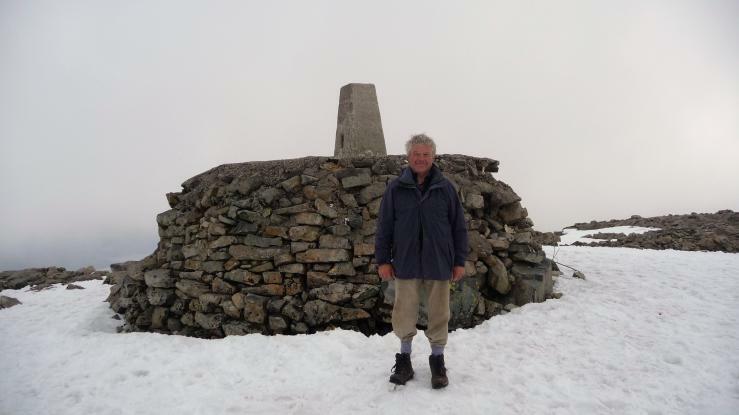 Have logged this in Sept 2011 as have found pics of me standing on trig. Friday 17th September Glorious sunny day for a honeymoon ascent of the big Ben with Bridget before we head of tomorrow to our holiday chalet on the Old Golf Course at Kilchoan on the western end of Ardnamurchan for the second week of honeymoon. my second ascent, after 1967 with dad as a teenager. 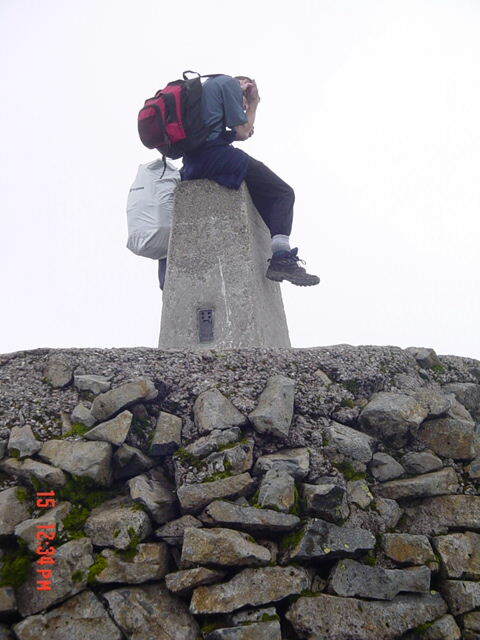 Climbed up with my Mum and Dad at the age of 16. Remember it being cold and misty. 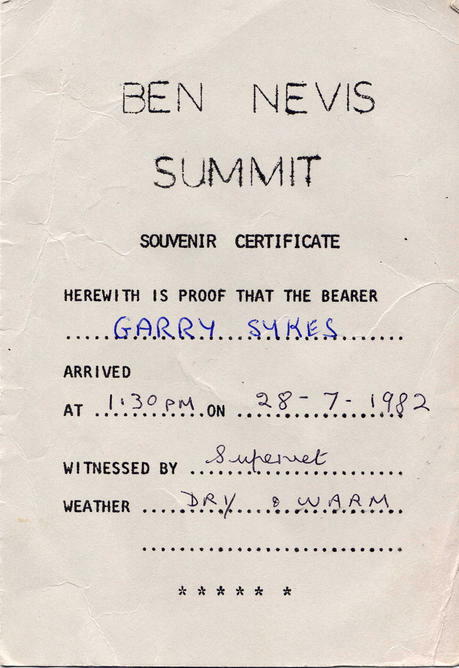 Found evidence of the exact date and time from the certificate pictured. Had been camping at the halfway lochan and a passing walker told us that Elvis had died..! 3rd visit (previous ones 7/65,9/74). Delightful walk including CMD. This is a retrospective log of a long ago visit with my younger sister when I was 17 and she 13. We had set out with my whole family (two more siblings plus ma and pa) in the morning on the, even then, very busy path up. One by one, the family dropped by the wayside but Louise and I carried on. 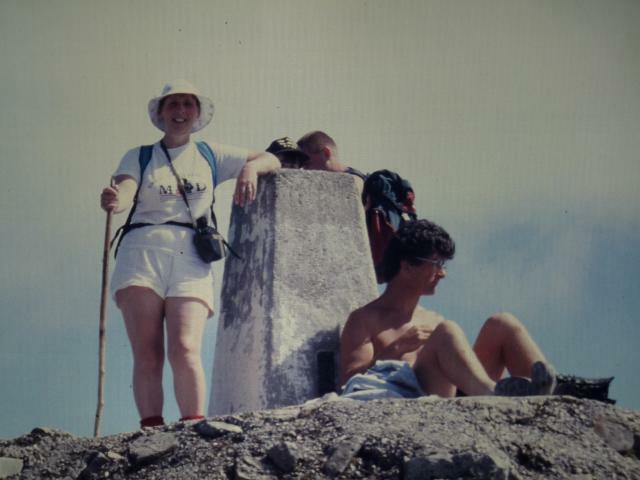 It's hard to believe that we did the whole trip to the top and back without water, a map, a compass, a hat, suntan lotion, walking boots, definitely not a mobile phone (as they weren't even on the horizon then) or any kind of idea of what we were actually taking on. 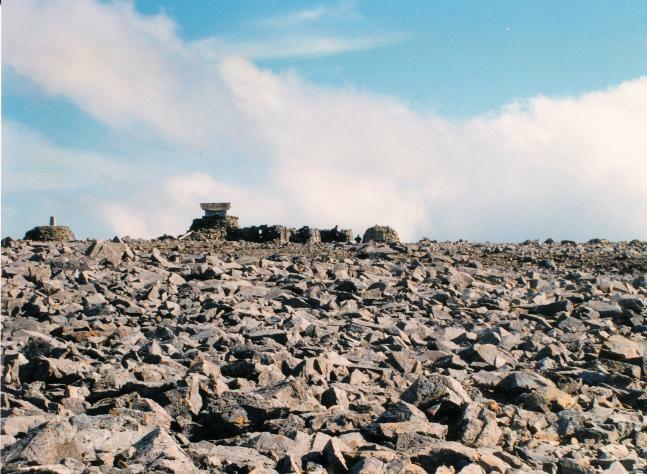 But we made it to the top in the middle of the afternoon and I was fascinated by the numerous little cairns of stones that people had erected to try and be higher than the actual summit itself. The views were breathtaking - it was clear and sunny at the time. Just below the summit, several hang gliders set off and soared off into the distance. Wonderful stuff! We came back down again, drinking from the streams (did we really do that? 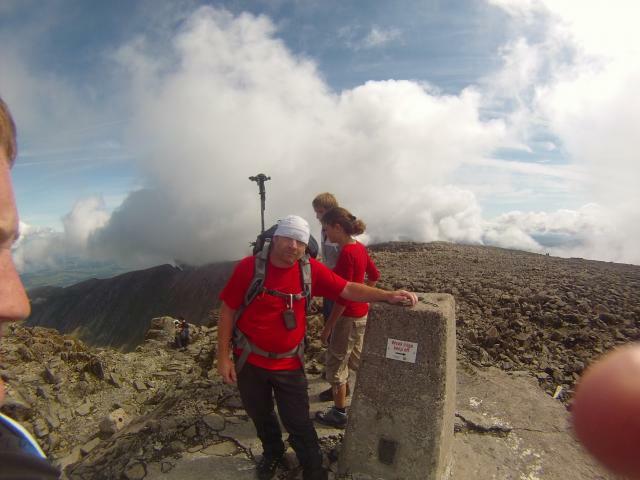 ), walking some of the way with other walkers, and eventually met up with a mountain rescue guide. Did my pa send him up to get us? I don't know, the question never occurred to me until recently, and my pa is dead now so I shall never get to ask him. But we made it back down at about eight o'clock in the evening and my pa was waiting for us in the car park. In terms of stupid things that I've done in my life, that trip to the top and back has to be one of the most foolhardy because of our lack of preparation, but luck and youth were on our side. It was the first trig that I ever did, long before I started to log them. As it's also the highest I'll ever do, it's about time that I did! Childhood visit aged 16. 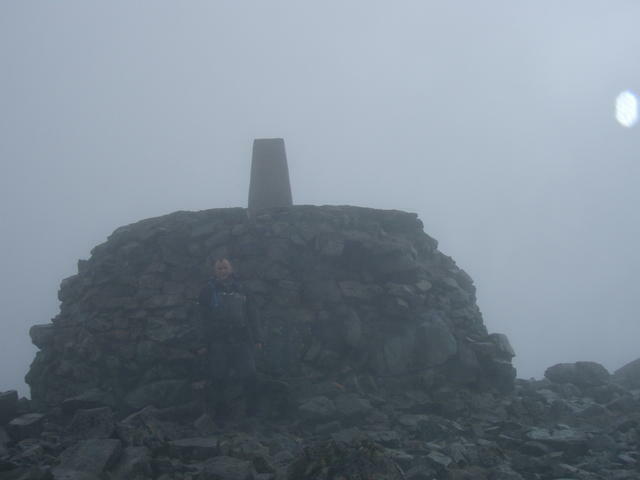 Cloud covered summit - nothing seen ! 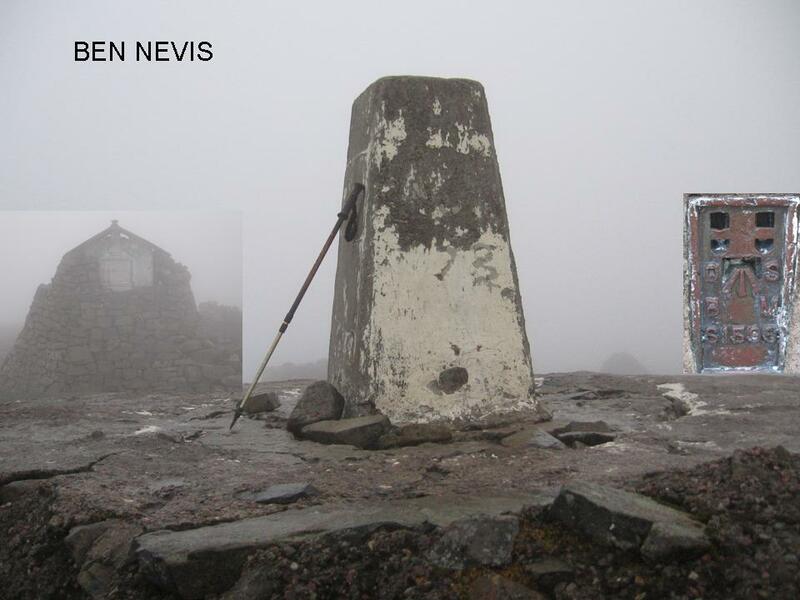 It's Wednesday 16th August I'm 15 and dad's taking me up Ben Nevis It'll be my 15t Munro but just my 9th new one. 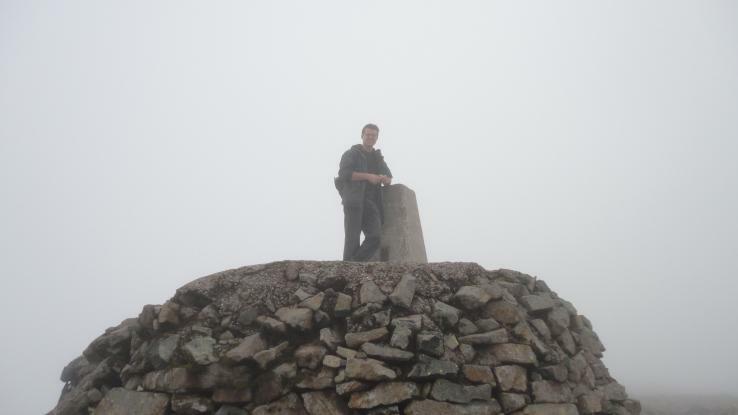 I've already been up Lochnagar 5 times Cairnwell twice and Cairngorm twice. 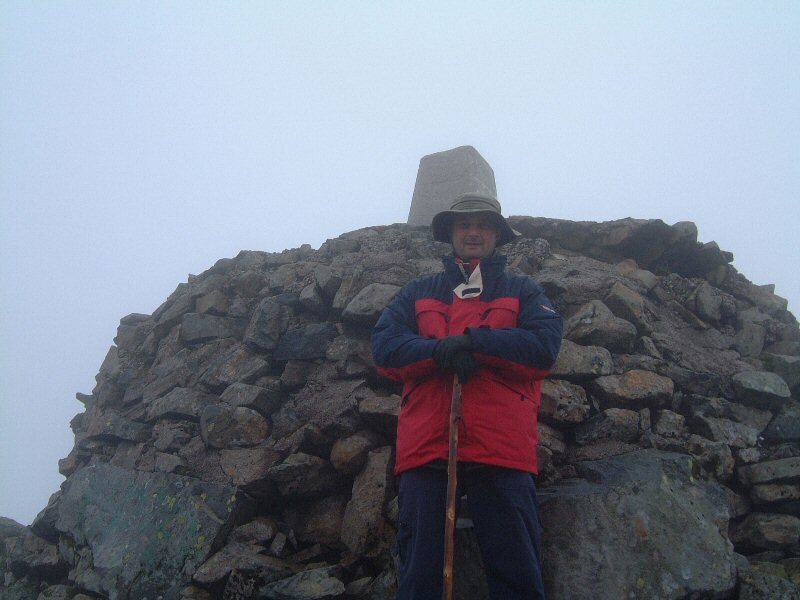 Carn mor Dearg is my 10th Munro. Some wisping mist but not totally clagged in. My second occasion where my Munro and Marilyn tally were the same!! 9 of each.